Requirements. 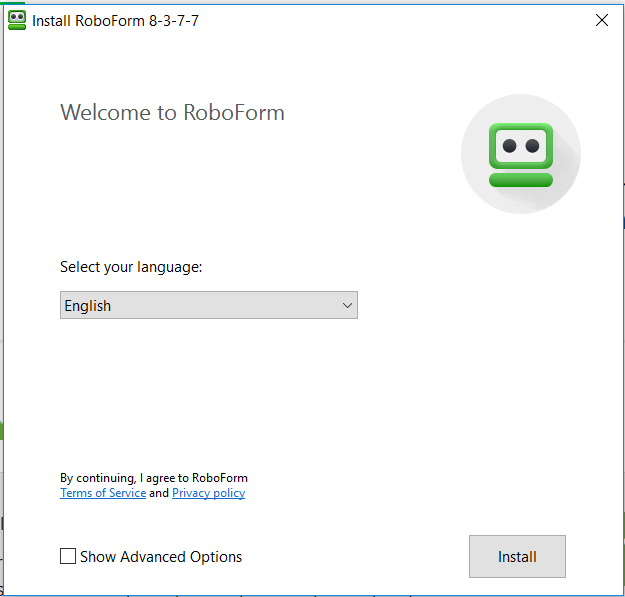 RoboForm for Windows works on Windows Vista, 7, 8, and 10 as well as Windows Server. Supported browsers include Internet Explorer 8.0 or later and the latest Google Chrome, Mozilla Firefox, and Opera. All service packs and security patches must be installed. Find your Download On the Download RoboForm page (roboform.com/download), Your Recommended Download for Windows will be at the top of the download options. 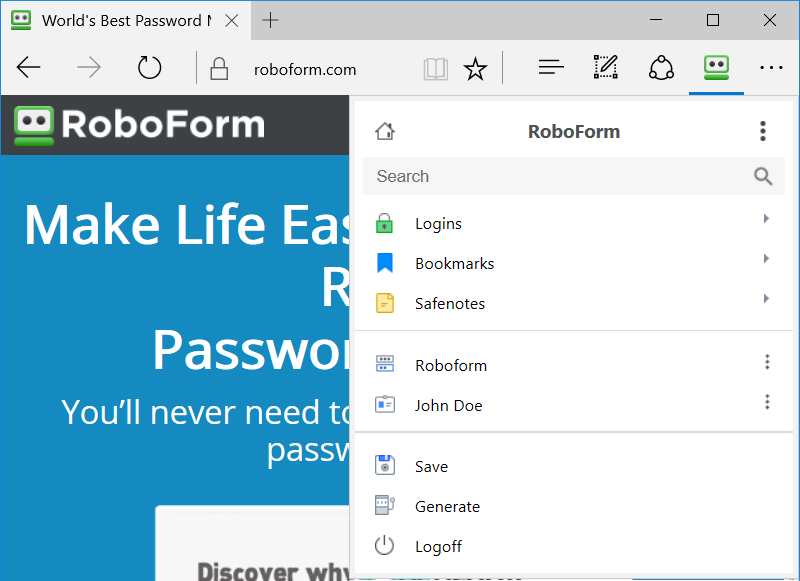 For Microsoft Edge, Chrome OS, and Linux, find the respective Standalone Extension in the tabs of the RoboForm Download Page. Start Download Follow one of these two steps to begin installation. After clicking the download button, click the tab on your downloads bar at the bottom of the screen. 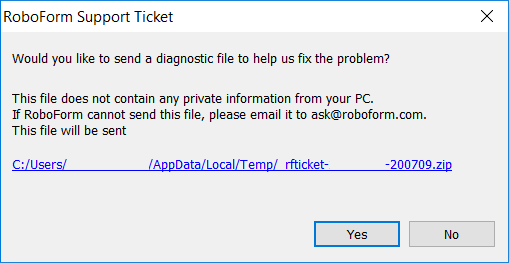 Select “Yes” once your computer asks permission for RoboForm to make changes to your PC. The installer will open. 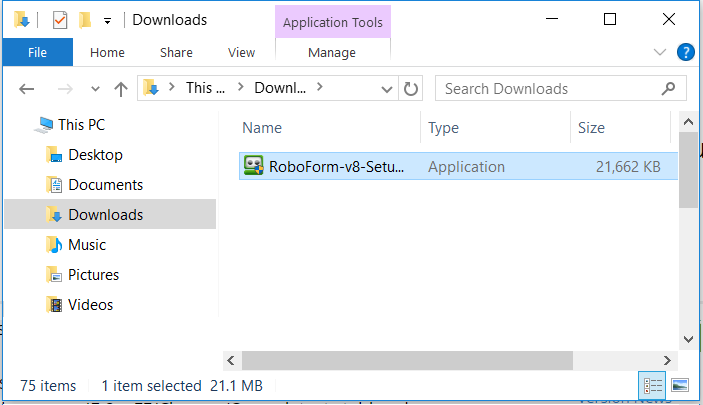 Using your PC’s File Explorer, find and double-click “RoboForm-8-Setup” in the Downloads folder. Then select “Yes” once your computer asks permission to make changes to your PC. The installer will open. Language and Terms of Service This window has Language and the RoboForm service agreement. 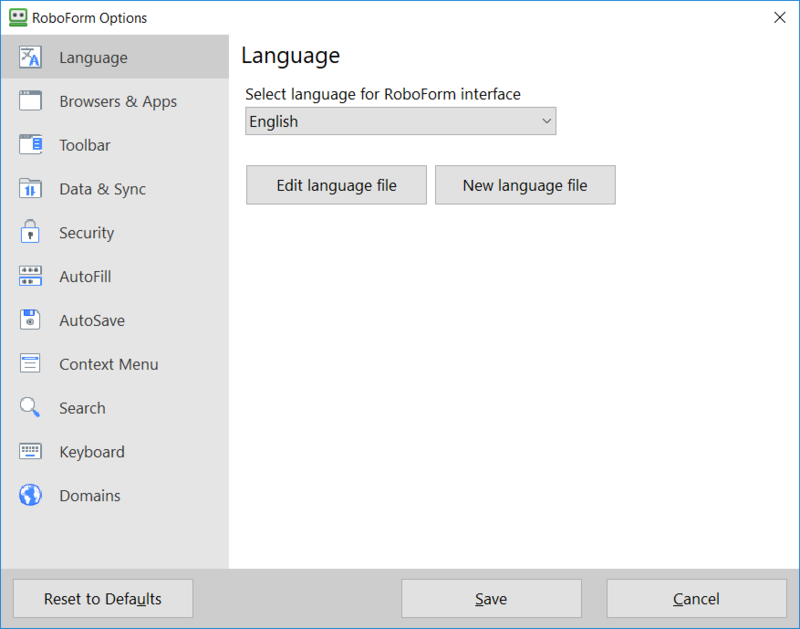 Select your preferred Language for RoboForm. Languages are ordered alphabetically in the drop down menu. You may check the option to Show Advanced Options during the installation. By clicking Next, you have read and agreed the RoboForm Terms of Service. Close Applications RoboForm will notify you of the applications that need to be closed in order to complete the installation process. 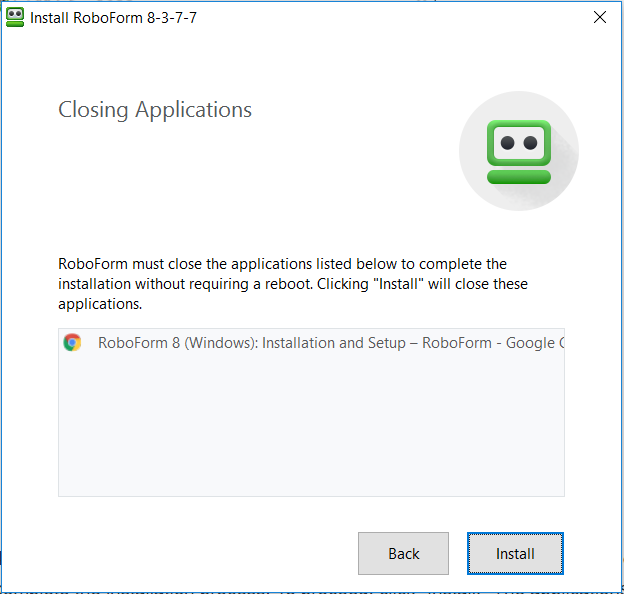 By clicking Install, RoboForm will close the listed applications and RoboForm setup will automatically run. Account Set Up RoboForm is now installed on your computer and you can either follow the steps to create a new account or login with an existing account. To create a free account, enter your Email and Master Password. Your Master Password will unlock all your other passwords, it is very important that you memorize your Master Password. 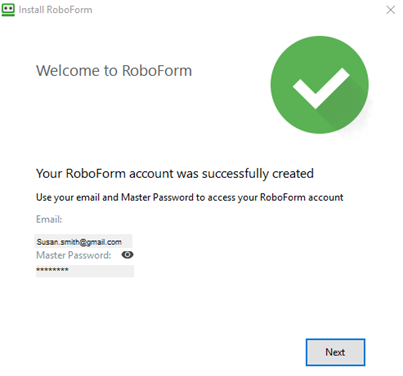 Click Login with Existing Account and login with your RoboForm Email and Master Password. Welcome to RoboForm Your RoboForm account was successfully created or logged into. Your credentials are listed below. Click Next to close the window. Bookmarks Bookmarks are websites and web pages you can save to RoboForm, similar to a Bookmark on your browser. Bookmarks leaves you one click away from your favorite web pages. Identity Your Identity is your personal profile. RoboForm can automatically fill in web forms, such as an online checkout. This can consist of name, phone number, address, driver's license, credit cards, etc. Contact This is your Address Book. Each entry in this Address Book is called a Contact. A Contact is like an Identity but is not used for form filling. Instead, it is used to lookup other people’s personal data such as their name, phone number, address, etc. Safenote You can store frequently-used text into what we call a Safenote. Safenotes provide storage for important information that is not automatically stored in Logins or Identity such as lock key combinations, secret family recipes, and software activation codes. Folder All of your RoboForm items can be categorized in Folders, similar to Windows Folders. Anything item of RoboForm Data be organized into Folders - including other Folders! Master Password This is the main password that unlocks all of your RoboForm Data for use. Do not forget your Master Password! RoboForm Add-On This is the main vertical or horizontal RoboForm Browser application. RoboForm Add-On is the term that will be used to characterize both Extensions and Toolbars. 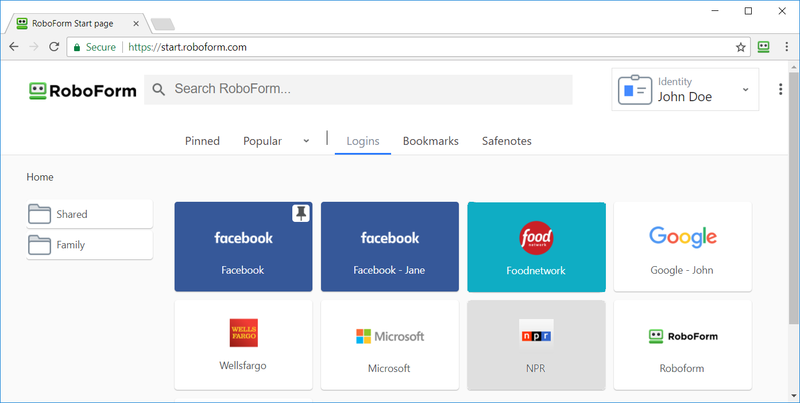 In Google Chrome, Mozilla Firefox, Opera, and Microsoft Edge, Roboform is seen as an Extension that is located in the top right corner next to the address bar. In Internet Explorer, RoboForm is seen as a long horizontal Toolbar typically underneath the address bar. The locations of the toolbar can be customized in options. RoboForm Taskbar Icon This button initiates the RoboForm menu that is located next to your computer’s date and time. Taskbar allows you to access RoboForm outside of your browser. RoboForm Editor This is an application within RoboForm. You can edit, create, and access RoboForm Data in the RoboForm Editor. RoboForm Start Page This is a web page located at https://start.roboform.com that allows you to view and access your local RoboForm Data on Windows or Mac (but not with the standalone extensions). The Start Page cannot be accessed without RoboForm being installed. RoboForm Web Access, a viewer and editor of RoboForm Data that can be accessed regardless of whether or not RoboForm has been installed (works with standalone extensions). Account-wide RoboForm Online Settings such as OTP and Licensing info. Logins Menu All of your Logins are organized alphabetically in the Logins Menu. This menu can be found in RoboForm Add-Ons, Taskbar Icon, and RoboForm Editor. Bookmarks Menu All of your Bookmarks are organized in the Bookmarks Menu. This menu can be found in RoboForm Add-Ons, Taskbar Icon, and RoboForm Editor. Identities Menu All of your Identities are organized alphabetically in the Identities Menu. This menu can be found in RoboForm Add-Ons, Taskbar Icon, and RoboForm Editor. Safenotes Menu All of your Safenotes are organized alphabetically in the Safenotes Menu. This menu can be found in RoboForm Add-Ons, Taskbar Icon, and RoboForm Editor. Matching Login In the RoboForm Add-Ons, Matching Login finds which Login is the best fit for the web page you are visiting. Identity Button In the RoboForm Add-Ons, the Identity Button shows an Identity that can fill the form on the web page. Help Menu This menu has all the resources that will help you understand how to use RoboForm. If you run into any problem, this menu can connect you to one of our Customer Support representatives. AutoSave Dialog This tool automatically pops up and offers to save Logins or Bookmarks for a web page. 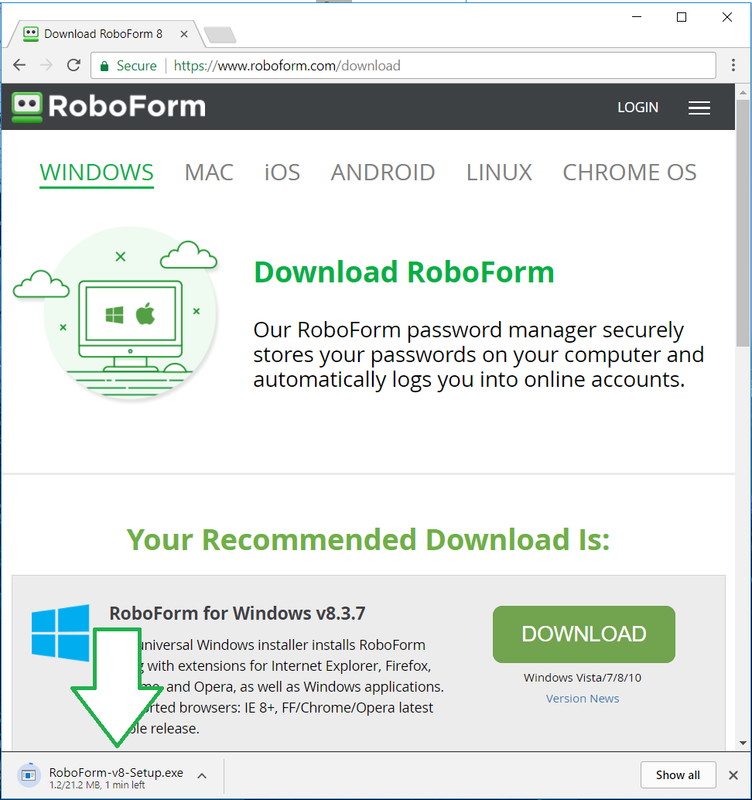 RoboForm Data is accessible on your browser(s) by using your Master Password to login to RoboForm. It's important to remember and protect this password in order to securely access your encrypted RoboForm Data. RoboForm works with your Browsers through Add-Ons. They will either be an Extension or a Toolbar. Find the browser(s) you use below to read more about browser-specific Add-Ons. RoboForm on Google Chrome, Mozilla Firefox, and Opera appears as an Extension in the upper-right hand corner next to the Address Bar. Clicking the Extension icon will open a vertical drop down menu. Show lower RoboForm toolbar attaches a RoboForm toolbar to the bottom of page. This is for those who prefer the toolbar over the extension. Show lower RoboForm toolbar for popup windows attaches a RoboForm toolbar to the bottom of popup windows. Enable popup RoboForm toolbar turns on the RoboForm Extension. Disabling this will attach a lower RoboForm toolbar to your browser. Set focus to RoboForm search box automatically highlights and allows you to type into the search box upon opening the RoboForm Extension. Clicking the RoboForm Extension in Chrome, Firefox, and Opera opens a Vertical Menu of RoboForm Functions. 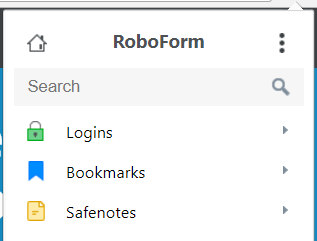 The Home Icon in the upper left corner opens the RoboForm Start Page in a new tab. Search Files opens a dialog window to search any item of RoboForm Data. Generate Passwords creates a randomly-generated and complex password for you to use and improve your Login security. Import allows you to import any data from browsers or other password managers to RoboForm. For browsers, click the Import button next to the browser name. For other password managers, click Import from File and follow the directions on the page. Import into folder: allows you to select a folder to import your data into. Search Box opens in the corner and allows you to search for RoboForm Data or for a query in a search engine. Reset puts the original values into the fields. Set completes any check box fields. Clear removes any text from the fields. RoboForm Start Page opens the RoboForm Start Page in a new window in your browser. 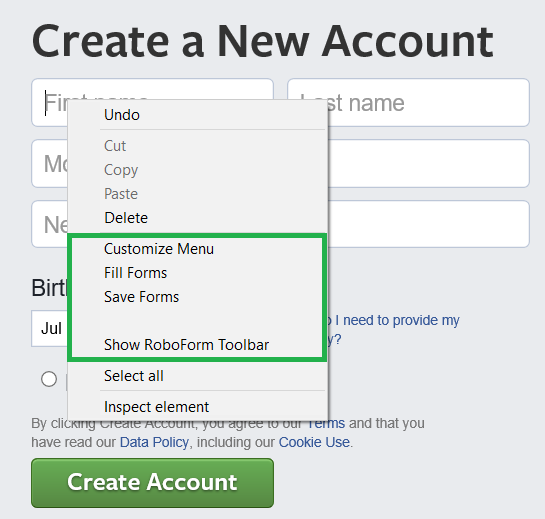 You can customize your RoboForm Data on the Start Page for easy access. Sync shows manual synchronization actions for RoboForm Data. Your RoboForm Data already automatically syncs when you either login with your master password or you edit an item. Sync RoboForm manually syncs your device and your RoboForm account. Show Changes (Analyze) analyzes the RoboForm data without syncing. Restore Deleted Data can restore the last 30 days of deleted data. Clean up Recycled Files (from server only) removes cached files from the RoboForm server. Delete State Files removes State Files from the RoboForm server. Automatic Sync does an automatic sync of your RoboForm data. Settings opens the options for sync in a new window, click the arrows next to Proxy Setting to open the advanced settings. Manage RoboForm Account opens a window for Roboform Online. Turn Off Sync stops automatic Syncing. Options opens the settings for RoboForm in a new window. Help Menu provides helpful resources about RoboForm. Manual on Toolbar opens the RoboForm manual for the Extension in a new web page. Entire Manual opens the RoboForm manual in a new web page. FAQs opens frequently asked questions for RoboForm in a new web page. Home Page opens the RoboForm website in a new web page. Buy RoboForm opens a Purchase RoboForm Everywhere web page. Check for Update checks what software version you have and whether it’s time to update RoboForm. Contact Support To contact support, you must submit a ticket to RoboForm’s support system. Find out how to submit a ticket in Chapter 9: Taskbar Icon. Problem Steps Recorder: This tool will help explain your problem to support in a step by step video format. Find out how to use Problem Steps Recorder in Chapter 9: Taskbar Icon. About shows the RoboForm License Agreement, the Version of RoboForm that you are using and whether your version of RoboForm needs to be updated. Search Bar allows you to locate any of your RoboForm Data quickly and search for queries in search engines. Logins allow you to view, create, print, and use your Logins within the browser. Bookmarks allow you to view, create, and go to your Bookmarks within the browser. Safenotes allow you to view, create, and print your Safenotes within the browser. The next section labeled “ Fill From: ” suggests what Logins and Identities could fill the forms of the Web Page you are on. The first tab shows the Matching Login, or the Login that is a good match for the Web Page. The Three Dots show more Login options. Read more in Chapter 4: Logins. The next tab(s) shows your the Identity button with your Identity. Creating more identities in RoboForm Editor will make more Identity buttons appear below your Identity. The Three Dots show more Identity options. Read more in Chapter 7: Identities. Save creates a Login or a Bookmark of the Web Page you are on. Generate creates a randomly-generated and complex password for you to use and improve your Login security. Read more in Password Generator. Sync does a manual sync between your RoboForm Data and your device. Security Center opens in a new window and evaluates the strength of your passwords. See more about Security Center in Chapter 15: Security Center. Logoff signs you out of RoboForm. This can be used to secure your RoboForm Data while somebody else is using your computer. RoboForm for Chrome Standalone appears as a Standalone Extension in the top right corner next to the Address Bar. A Standalone Extension means that RoboForm and its functions are only accessible within the browser - RoboForm does not need to be installed onto your computer. 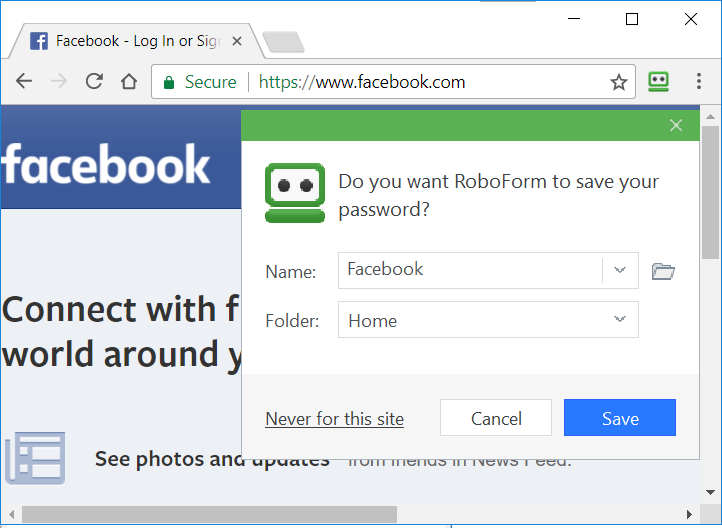 Chrome OS and Linux users can only run RoboForm using this standalone extension. Here are all of the functions that are in the RoboForm Standalone Extension for Chrome. Opening the RoboForm Extension in the top right corner lists many functions. RoboForm Home Button opens RoboForm Online in a new window. Read more in Chapter 16: RoboForm Online. The Three Dots in the top right corner have more options. New Folder creates a New Folder for your RoboForm Data. New Identity creates a new Identity within the browser. Recent shows your recently used Logins. Options opens the settings for RoboForm which are explained at the bottom of this section. Help opens the help menu which is described further below within this section. Edit opens the in-browser editor. The tabs along the top represent each Identity Element. Read more in Chapter 7: Identities. Fill Forms completes the forms on the website. Fill and Submit automatically fills the form and submits the form on the website. Rename changes the name of the Identity. Contacts allow you to view and create Contacts. Clicking the Three Dots in the upper right corner of Contacts shows the same options that are in the Three Dots of Identity, explained above. Right Clicking a Contact shows the same options that are shown when you right click an Identity, explained above. Help provides access to helpful resources about RoboForm. RoboForm Account opens RoboForm Online. Read more in Chapter 16: RoboForm Online. RoboForm Home will open the RoboForm’s website. About shows which version your RoboForm is. Edit opens the in-browser editor. Login in Same Window logs you in the same browser window that you are using. Login in New Window logs you into a new browser window. Go & Fill opens the website and fills the forms with the Login. Go To opens the selected website. Rename changes the name of the Login. Go to opens the web page in the browser window being used. Rename changes the name of the Bookmark. 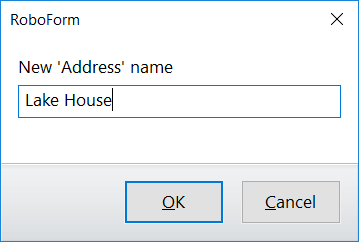 Rename changes the name of the Safenote. The next part of the extension suggests what Logins and Identities could fill the forms of the Web Page you are on. The Three Dots show more Matching Login options. Read more in Chapter 4: Logins. The next tab(s) shows the Identity button with your Identity. Creating more identities in RoboForm Editor will make more Identity buttons appear below your Identity. Generate creates a randomly-generated and complex password for you to use and improve your Login security. Read more in Chapter 12: Password Generator. Account shows the email associated with your account. Change Account Password allows you to change your Account Password. Note that this is your Master Password, it is important to remember this password. Simply click the Change Account Password button, fill in your Old Password and fill in your New Password into the bottom two fields. Click Change. 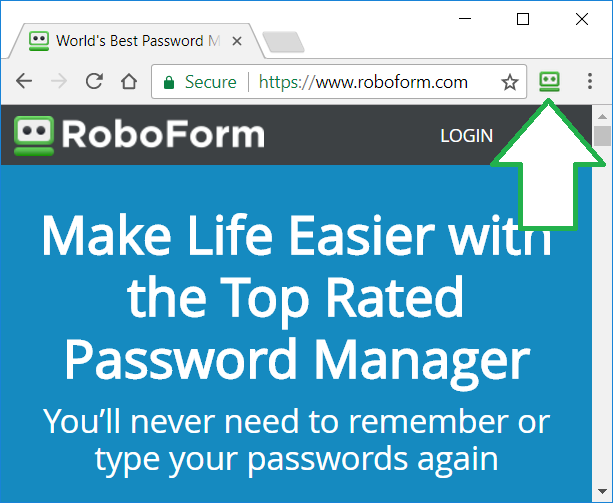 Cache Master Password between browser sessions allows your RoboForm to stay logged in even after closing your browser window. Automatically Logoff after idle (minutes 0-99999) sets a time period for RoboForm to automatically log off while the computer is idle. The time period will only go into effect the next time you log into RoboForm. Offer to Save Logins from web (HTML) forms will open the AutoSave dialog when you are saving a Login web form, also known as HTML form. ALT+click of Login button forces AutoSave is a simple option. Type in your login details and select ALT + click the login button for the AutoSave Dialog to appear. SHIFT+ENTER in text field forces AutoSave is also simple. Click Shift and then Enter, AutoSave will then open for any text field. Highlight filled fields will highlight the fields that have already been filled. ‘Fill & Submit’ is the default action for Matching Logins means that when you click the Matching Logins button, it will automatically fill in the Login forms and submit them. 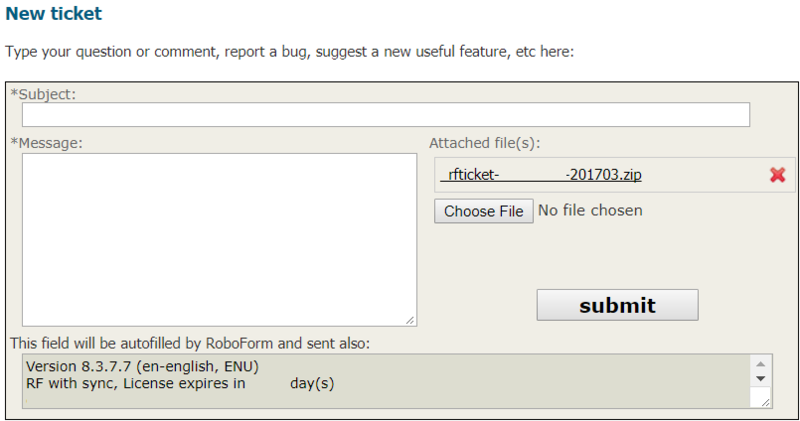 Uncheck this if you would like RoboForm to Fill Forms but not submit them. You can select which search options and sites will be shown in the Search Bar. The options are to search RoboForm Names (which are items or folders of RoboForm data), Bing, Google, Yahoo, eBay, and Amazon. RoboForm on Internet Explorer appears as a horizontal Upper Toolbar that is located below the Address Bar. A Lower Toolbar will appear at the bottom of Popup windows in IE and has the same functionality as the Upper IE Toolbar. The RoboForm Button has a drop down menu that lists many functions that reappear in the rest of the Toolbar. Logins allow you to view, create, print, and use your Logins. Bookmarks allow you to view, create, and go to your Bookmarks. Identities allow you to view, create, print, and use your Identities. Safenotes allow you to view, create, and print your Safenotes. Editor opens the RoboForm Editor. Read more in Chapter 8: Roboform Editor. Fill Forms completes the forms on the page with the Matching Login or Identity. Read more in Chapter 4: Logins. Save Forms creates a Login or a Bookmark for the Web Page you are on. Manage RoboForm Account opens a window for Roboform Online. Read more in Chapter 16: RoboForm Online. Tools are miscellaneous options for RoboForm. Generate Passwords creates a randomly-generated and complex password for you to use and improve your Login security. Read more in Chapter 12: Password Generator. 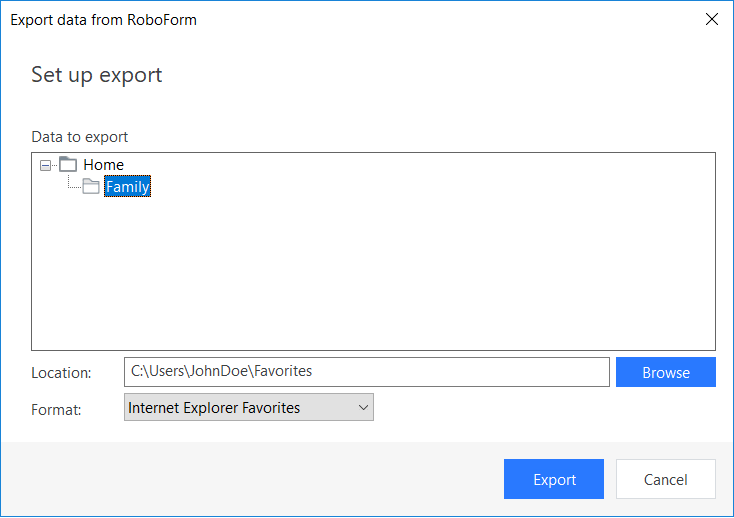 Import allows you to import any data from browsers or other password managers to RoboForm.For browsers, click the Import button next to the browser name. For other password managers, click Import from File and follow the directions on the page. Search Box directs you to the IE toolbar search box. Search for RoboForm Data or for a query in a search engine. Read more in Chapter 11: Search Box. RoboForm Start Page opens the RoboForm Start Page in a new window in your browser. You can view and access your RoboForm Data on the Start Page. Customize Toolbar gives you options of how to organize your IE Toolbar. Customize Toolbar shows you all the current toolbar buttons and what buttons can be added to the Toolbar. Toolbar Options opens all the toolbar settings in RoboForm Options. Read more in Chapter 18: Options. The last three options show some visibility options for Labels and Icons in the RoboForm Toolbar. Emergency Access opens Emergency Access in a new window. This feature allows approved RoboForm users to gain access to your RoboForm data in case of an emergency. Read more in Chapter 14: Emergency Access. Security Center opens Security Center in a new window. This tool evaluates the strength of your passwords. Read more in Chapter 15: Security Center. Options opens the settings for RoboForm in a new window. Read more in Chapter 18: Options. Manual on Toolbar opens the RoboForm manual for the Toolbar in a new web page. Hide Toolbar removes the RoboForm toolbar from view. The next button looks like another Login Button, but this is the Matching Logins button. This shows the Login that is a good match for the Web Page you are on. Read more in Chapter 4: Logins. 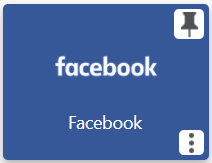 The next tab(s) shows the Identity button with your Identity. Creating more identities in RoboForm Editor will make more Identity buttons appear next to your Identity. Read more in Chapter 7: Identities. Home opens the RoboForm Start Page in a new tab. Read more in Chapter 17: RoboForm Start Page. Use the Web Page Context Menu when you need to open RoboForm from a web page that has no RoboForm Toolbar. This menu appears on web page when you right-click it. You are able to Customize Menu, Fill Forms on the web page, Save Forms as a new Login, and Show RoboForm Toolbar if it is not visible. You can customize this menu in Options > Context Menu. Read more in Chapter 18: Options. 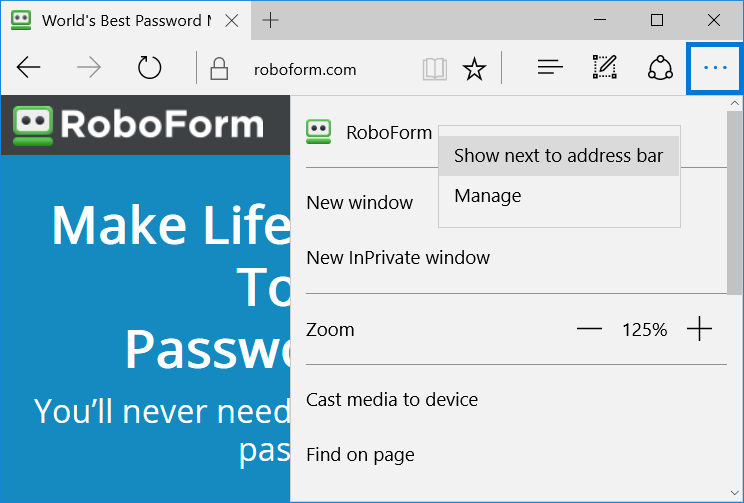 RoboForm on Microsoft Edge appears as a Standalone Extension in the top right corner next to the Address Bar. A standalone extension means that RoboForm and its functions are only accessible within the browser - RoboForm does not need to be installed on your computer. You might have to attach the Extension to Edge by selecting the Three Dots in the top right corner of the browser, right-clicking the RoboForm Extension, and selecting Show Next to Address Bar. The Three Dots in the upper right corner of Identities will have the same options that that the Three Dots in Identity. Right clicking a Contact will show the same right-click options for an Identity. Go To only opens the selected website. Goto in Same Window opens the web page in the same Browser window being used. Goto in New Window opens the web page in a new Browser window. Safenotes allow you to view, create, and print your Safenotes within the browser. Right clicking a Safenote will show the following option. You can access the Options for the Microsoft Edge Standalone Extension by clicking the three dots in the RoboForm Extension, and selecting Options. Use Logins to store data that is specific to a web site; data such as Usernames, Passwords, Survey fields, Win32 applications logins (E.g. Skype), etc. Essentially, you can save any form data to Logins and use it to automatically fill any form later. 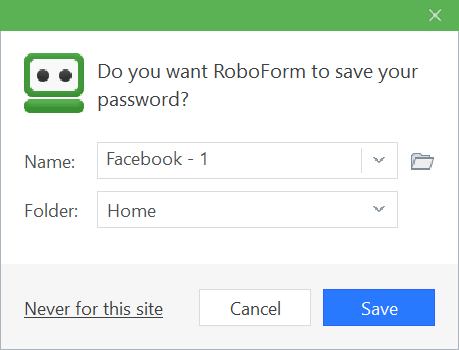 When you manually enter login data to a login page and click the Login (Submit) button, RoboForm will offer to save this login info by displaying the AutoSave dialog. Login manually into a website. Clicking Never for this site will disable RoboForm AutoSave from popping up on the website you are on. The AutoSave dialog pops up only if the Login data you entered is New, Different, or Updated. It will not prompt you if the exact same data (E.g. Username & Password) are already saved to RoboForm. If you have multiple accounts for the same website, RoboForm will suggest to label your new login with a number. You might have to do a Resave or Manual Save of a Login if the website’s login page has been changed or updated. Simply manually login, and in the AutoSave dialog simply overwrite and save the original Login. Pages that have no password fields. Non-login forms, which we typically classify as Identities. Holding ALT key and clicking the Login/Submit button on web page. Note: On Google Chrome, this action will also download the link Submit button. Holding SHIFT key and pressing the ENTER key in the password field or in any field where ENTER causes form submission. Click the Save button in your RoboForm Add-On. The Save Form dialog will open. Enter the Login name and click Save. All form data on the web page will be saved to this Login. You can also invoke the "Save Forms" in Internet Explorer by right-clicking the web page and selecting Save Forms. Note: RoboForm selects the best “Submit” button - which may be different from the button you want to be selected (eg: Save Info Button). Use Forced AutoSave (Alt + Click) to tell RoboForm which button to click. Some sites require you to fill in a Captcha field on login or signup. Captcha fields cannot be AutoSaved since they change on every login; users are manually required to enter this information according to website directions - don’t save the Captcha to RoboForm. You can however, mark a Captcha field in the RoboForm Editor so it ignores the field when you log in. AutoSave your login normally, including the Captcha field. Open this newly saved Logins in the RoboForm Editor. With your mouse, select or highlight the field that saved the Captcha field. Click More in the top right corner, then Fields > Ignore Fields. Editor will put "$AnyValueHere$" into the field, such fields will be ignored by AutoFill, Login and AutoSave. Editor will also add a Login Tip to add a useful tip if needed. If you would like to remove this, select More > Fields > Remove Login Tip. If you make any mistakes when marking a Captcha fields, select More > Drop Changes. The Login will revert the changes. 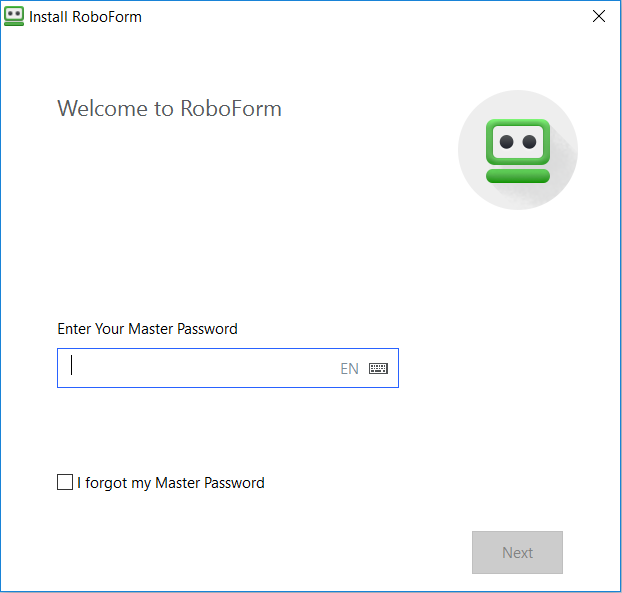 RoboForm does the entire Login sequence for you, just by going to Logins in your RoboForm Add-On, RoboForm Taskbar Icon, or RoboForm Editor and selecting or double-clicking the desired Login. Another method is to use RoboForm Search box in your Add-On, Taskbar, and Editor. Just type your desired Login and select the Login. 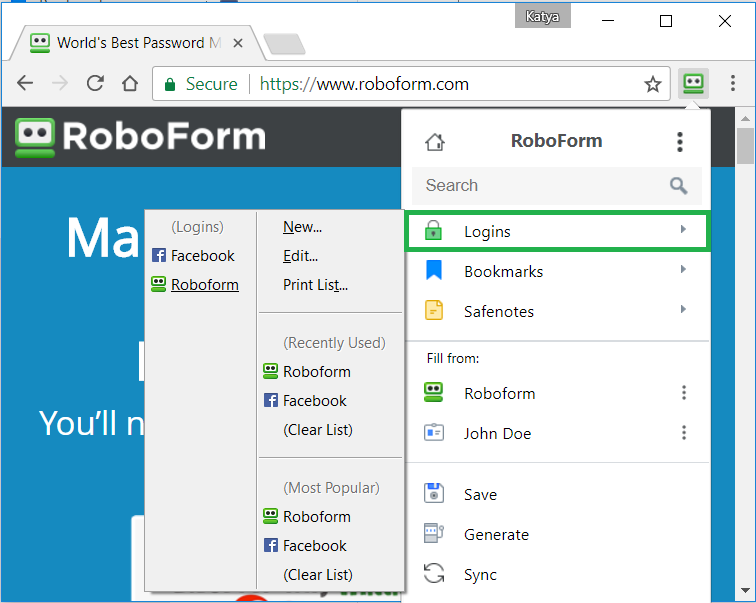 This menu in the RoboForm Add-Ons and RoboForm Taskbar Icon allows you to view all of your Logins. New creates a New Login in RoboForm. Edit opens up RoboForm Editor which is detailed in Chapter 8: Roboform Editor. Print List (in Add-Ons) creates a printable list of Logins. A dialog appears that previews the printed list of Logins. You may click the Print button to print what you see or click Save to save it to an HTML file. Recently Used Logins The most recently used Logins are in a reverse chronological order. The option (Clear List) clears up the Recently Used Logins list. Most Popular Logins These are the Logins that are used the most often. The most popular Login is shown first. The option (Clear List) clears up the Most Popular Logins list. You may manually add a Login or Bookmark to the Most Popular list by right-clicking the Login > Add To > Most Popular/Start Page. Removing a manually added Login or Bookmark can be done by right-clicking the Login > Remove from Most Popular/Start Page. When you visit a website with one of your saved Logins, the RoboForm Add-On will show the Login that best matches your website. This button is called the Matching Logins button. Click the Matching Login to log in to the website. The default Fill and Submit feature will automatically fill the form and submit the form. There are more form filling options in the dialog of the Matching Dialog button. Simply click the three dots on the right-side of the Matching Login Button. In Internet Explorer, hover over the mouse to show these options. Fill Empty Fields Only by selecting the checkbox. Only the empty fields on the page will be filled. If this option is unchecked, RoboForm fills both empty and non-empty fields. Show All Logins will open up the main Logins Menu. Edit opens RoboForm Editor, which is detailed in Chapter 8: Roboform Editor. Fill Forms will fill out the website’s form with your Login, but will not Submit the Login. There are even more options within the Matching Login button. Edit ‘Login Name’ opens RoboForm Editor, which is detailed in Chapter 8: Roboform Editor. Set as Default is to set one of your Multiple Logins as the Default Login, if you would like to give preference to one Login. 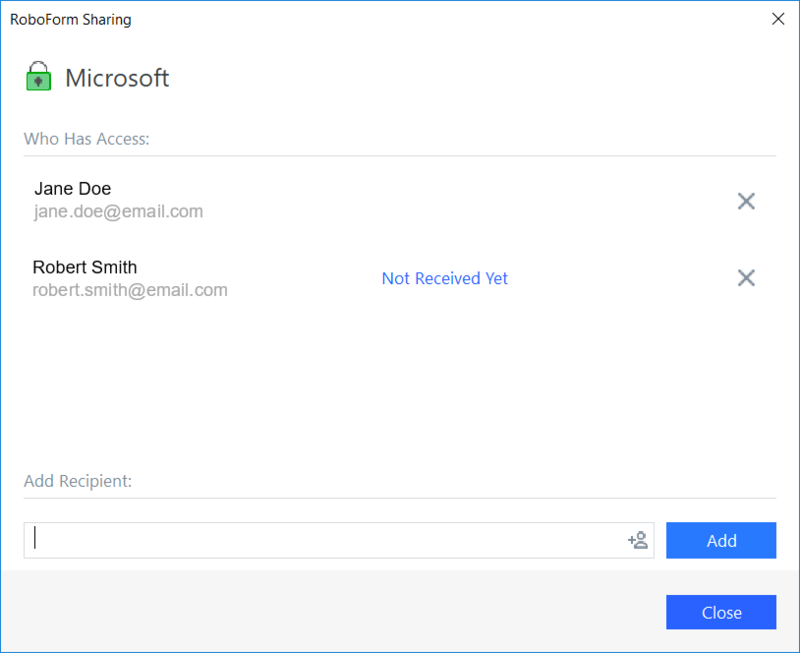 Sharing opens the RoboForm Sharing window to securely share RoboForm Logins. Sending opens the RoboForm Sending window to securely send RoboForm Logins. See more about Sharing and Sending in Chapter 13: Sharing and Sending. Set Reminder creates a timed notification to update your password for that Login. IE Favorites Bar (shortcut), in Internet Explorer. Bookmarks toolbar, in Firefox and Chrome. Most Popular/Start Page, in your Browser’s RoboForm Add-On. Show opens the details of the Login in a pop-up window. Move allows you to place the Login into a different Folder. Clone duplicates the Login in Logins. If you have more than one Login that matches a web site, by default, RoboForm will suggest to label additional logins with “ - N ”; N represents the number of additional Logins for that site. However, a different name can always be selected during saving or by renaming. When there are multiple Matching Logins, a ‘(+ N)’ will be to the right of RoboForm’s top-ranked one to notate how many additional Matching Logins there are for that website. See below for more info on Login Order for how this ranking is computed. Simply, click the three dots on the Matching Login Button to open the list of Logins that match the website. In Internet Explorer, hover over the Matching Login Button to do this. 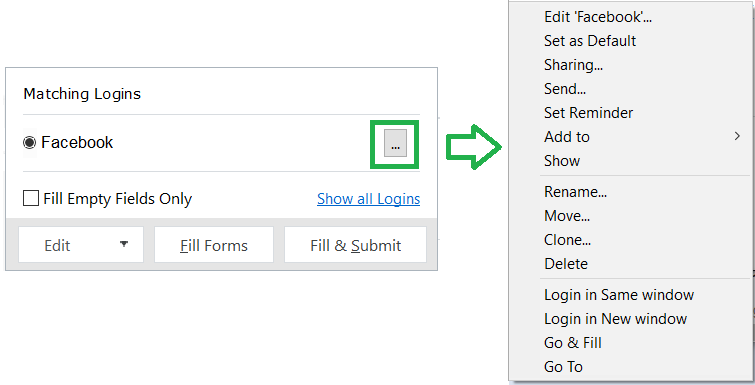 In order to log in to the account you want to use, simply select that Login out of the list and select one of the Login actions that are detailed in the section above. A search bar will appear in the Matching Logins Button if you have 9 or more Logins to the same Website. Login URLs that exactly match the URL of the web page will appear on top. Logins that match the web page URL partially will appear next. Logins that only match the domain will appear last. Domains will match with the suffixes of the URL; www.roboform.com matches online.roboform.com, but will not match www.roboform.net. Some sites have multiple steps or web pages to Login (E.g. Bank of America SiteKey). Currently RoboForm cannot run the entire sequence in one click, but it can do it in two clicks. Save a Login for each step of the Login process. For example, if the first page only asks for a UserID, you may have to Force AutoSave a Login if the AutoSave dialog doesn’t come up by itself. You can Force AutoSave by clicking ALT while Clicking/Submitting the page to the next step. Continue this process of Force AutoSaving separate Logins for each step of the Login process. If needed, remember to rename your steps so they are clear. For example, “Bank of America Username”, “Bank of America Password”. Select the Login that corresponds to the first step in the site’s login sequence (E.g. Bank of America Username). Select the Login that corresponds to the next step in the site’s login sequence (E.g. Bank of America Password, etc) until you are logged in. Login in Same Window logs you in in the same browser window that you are using. Login in New Window logs you in into a new browser window. Go & Fill opens the website and fills the forms. Fill Forms completes the forms on the selected website. Edit opens the selected Login in the RoboForm Editor. Read more in Chapter 8: Roboform Editor. 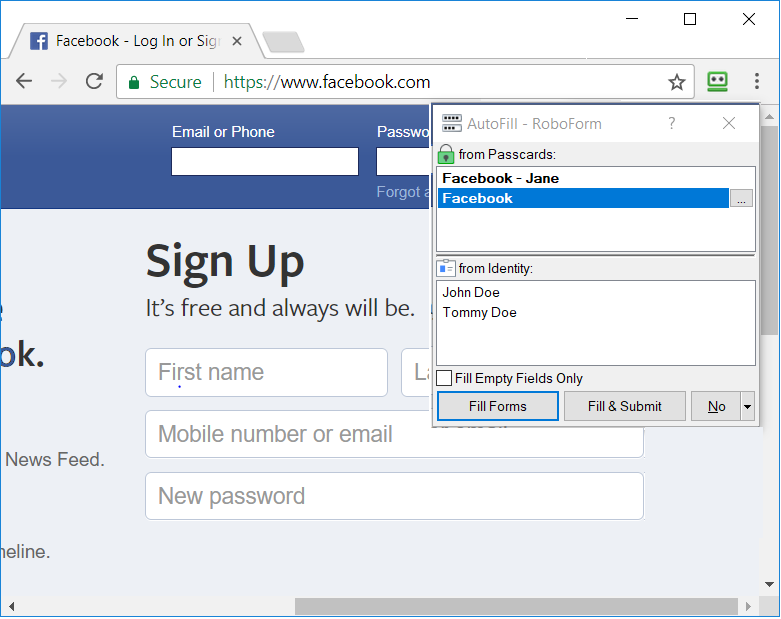 Send opens the RoboForm Sending window to securely send RoboForm Logins. Read more about Sharing and Sending in Chapter 13: Sharing and Sending. Set Reminder creates a timed notification for you to update the password for that Login. There are additional Login Options in the RoboForm Editor which are detailed in Chapter 8: Roboform Editor. 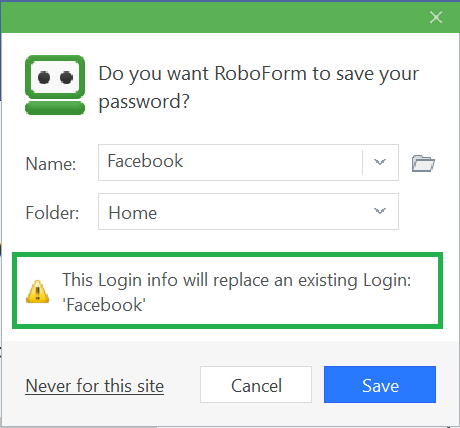 For Windows Applications such as Skype and iTunes, RoboForm can save your Login. Simply Login to your application and the AutoSave Dialog will appear as a lower toolbar offering to save the password. If the lower toolbar does not appear, open the RoboForm Taskbar Icon > Browsers, and select your application. A lower toolbar will attach to the bottom of the selected application’s window. Force AutoSave the Login by Alt + Clicking the Login/Submit button when you are logging into the application. You can find your Application Logins in RoboForm Editor > Applications. Read more about Applications in Chapter 8: Roboform Editor. Options for Applications are under Options > Browsers & Apps, read more about those in Chapter 18: Options. Basic Authentication is an older authentication mechanism that is rarely used. 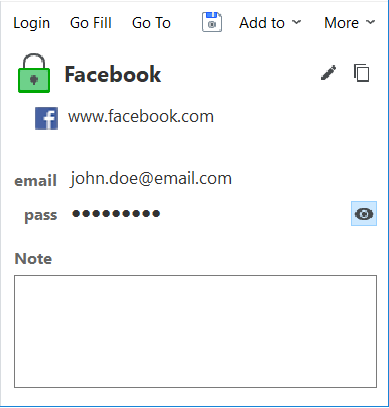 AutoSave for Basic Authentication: Options > AutoSave > Offer to save Logins from Windows dialogs in Browsers (Basic Auth). AutoFill for Basic Authentication: Options > AutoFill > Offer to AutoFill Windows dialogs. To fill a Basic Authentication dialog from a Login, select Fill Forms from the RoboForm Add-On. 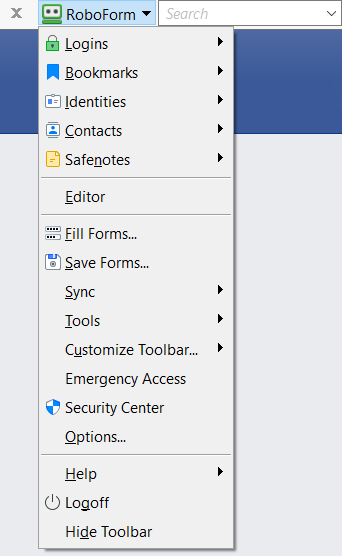 To save a Login from a Basic Authentication dialog, select Save Forms from the RoboForm Taskbar Icon menu. Note: Basic Authentication dialogs cannot be filled from Identities, they can only be filled from Logins. Go to the web page that you would like to save. In the RoboForm Add-On, click the Save Button next to the image of the diskette. Make sure to mark that you are saving a Bookmark and not a Login. In the RoboForm Add-On, select Bookmarks > New. In the RoboForm Taskbar Icon, select Bookmarks > New. Select which Folder you would like your Bookmark to be in. 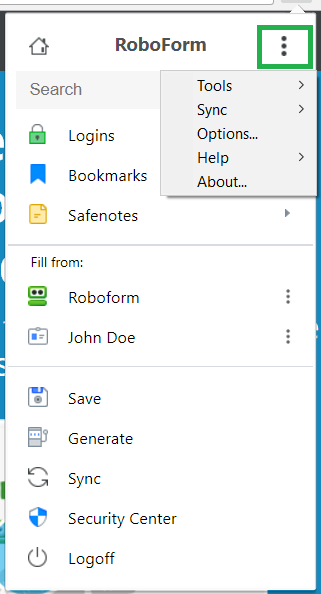 You can find your Saved Bookmarks in your RoboForm Add-On, the RoboForm Taskbar Icon, or the RoboForm Editor under Bookmarks. RoboForm Add-On Click the Bookmarks button in your RoboForm add-on and select your desired Bookmark. RoboForm will open that address within the same tab. RoboForm Taskbar Icon Click the Bookmarks button in RoboForm Taskbar menu and select your desired Bookmark. RoboForm will open that address in a new window. RoboForm Editor Open Bookmarks in the Editor, select your desired Bookmark, and click the Go To button in Editor’s details toolbar. RoboForm will open that address in a new window. There are additional ways to open Bookmarks that are covered in Bookmark Options below. New creates a New Bookmark in RoboForm. Edit opens up the Bookmark in RoboForm Editor which is detailed in Chapter 8: Roboform Editor. Recently Used Bookmarks The most recently used Bookmarks are in a reverse chronological order. The option (Clear List) clears up the Recently Used Bookmarks list. Most Popular Bookmarks These are the Bookmarks that are used the most often. The most popular Bookmark is shown first. The option (Clear List) clears up the Most Popular Bookmarks list. You may manually add a Login or Bookmark to the Most Popular list by right-clicking the Bookmark > Add To > Most Popular/Start Page. Removing a manually added Login or Bookmark can be done by right-clicking the Bookmark > Remove from Most Popular/Start Page. Sharing opens the RoboForm Sharing feature that allows you to securely share your Bookmark to other RoboForm users. Sending opens the RoboForm Sending feature that allows you to securely send your Bookmark to other RoboForm users. Read more in Chapter 13: Sharing and Sending. Move allows you to move the location of a Bookmark to another Folder in RoboForm. Clone duplicates the Bookmark in the Bookmark Menu. There are additional Bookmark Options in the RoboForm Editor which are detailed in Chapter 8: Roboform Editor. First, pick which RoboForm Tool you will use and follow its next step. In a RoboForm Add-On, select (Safenotes > New). In the RoboForm Taskbar Icon, select (Safenotes > New). In the RoboForm Editor, select the ‘ + ’ next to Safenotes. 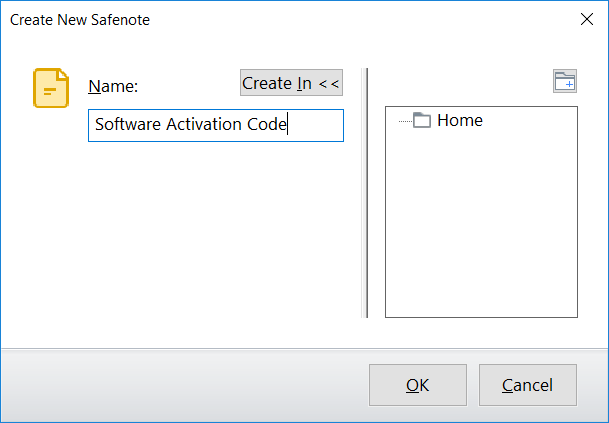 The Create New Safenote dialog will pop up. Select its Folder location in the Create In option. You can add Text to your Safenote in RoboForm Editor. Simply select the Safenote in Editor, and enter your text in the large space underneath the Safenotes name. Safenotes in Editor are detailed in Chapter 8: Roboform Editor. RoboForm Add-On Select the Safenote in the Safenote menu. It will open in RoboForm Editor. RoboForm Taskbar Icon Select the Safenote in the Safenote menu. It will open in RoboForm Editor. RoboForm Editor Select the Safenote in the Safenote menu. It will appear in the Details Pane (right side) of RoboForm Editor. 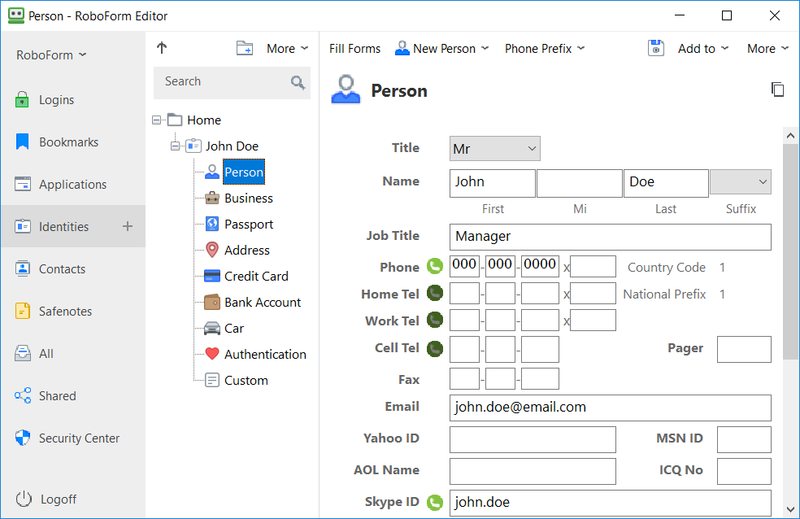 New creates a New Safenote in RoboForm. Print List (in Add-Ons) creates a printable list of Safenotes. A dialog appears that previews the printed list of Safenotes. You may click the Print button to print what you see or click Save to save it to an HTML file. Recently Used Safenotes The most recently used Safenotes are in a reverse chronological order. The option (Clear List) clears up the Recently Used Safenotes list. Copy Text copies the Safenote text to your clipboard. Show opens the Safenote in a pop-up window. Edit opens the Safenote in RoboForm Editor. 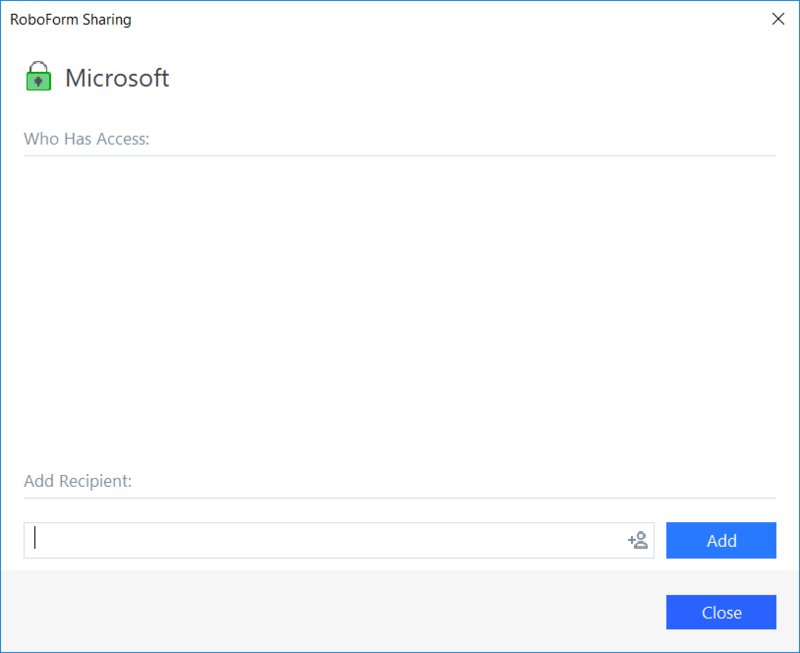 Sharing opens the RoboForm Sharing feature that allows you to securely share your Safenote to other RoboForm users. 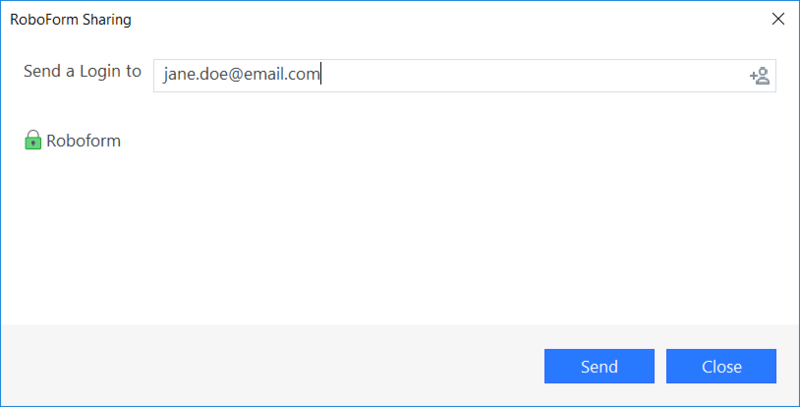 Sending opens the RoboForm Sending feature that allows you to securely send your Safenote to other RoboForm users. Read More in Chapter 13: Sharing and Sending. Move allows you to move the location of a Safenote to another Folder in RoboForm. 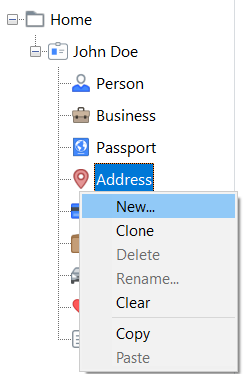 Clone duplicates the Safenote in the Safenote Menu. There are additional Safenote Options in the RoboForm Editor which are detailed in Chapter 8: Roboform Editor. Your main tool for managing Identities will be the RoboForm Editor which you can read more about in Chapter 8: Roboform Editor. 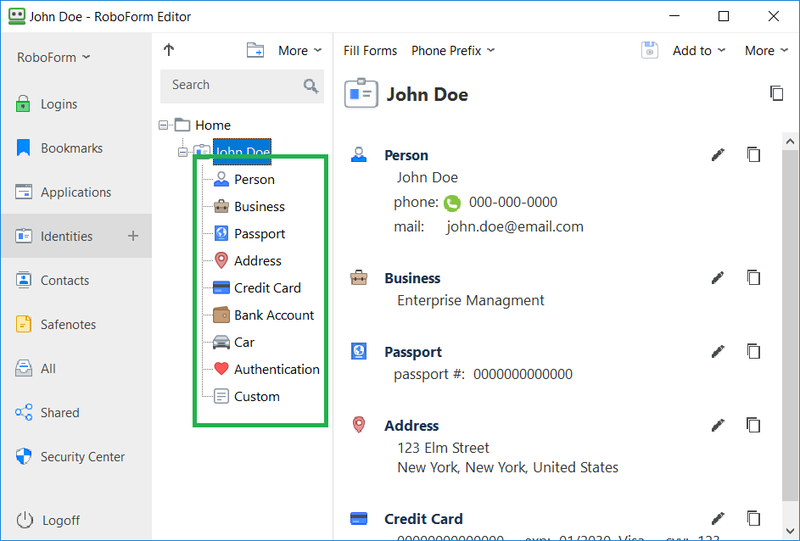 In Editor, clicking on your Identity name in Navigation Pane (2nd from the left) opens an Identity Summary, or an overview of all your Identity’s information. Clicking the + next to your Identity in the Navigation Pane opens a menu of Identity Elements (E.g. Person), or categories that make up an Identity. Each Identity Element (E.g. Person) is made up of individual Identity Fields (E.g. Phone), or distinct personal details. 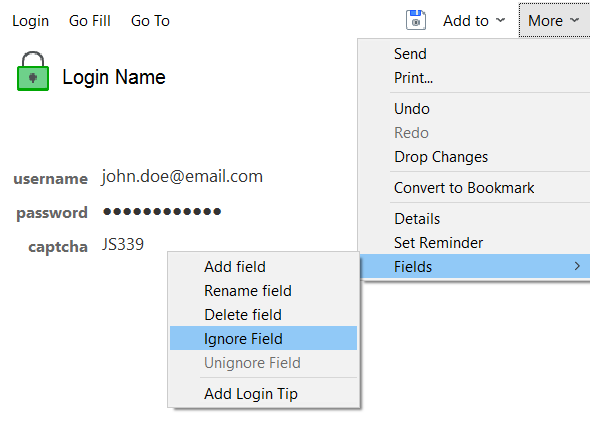 Clicking an Identity Element will open the Identity Fields in the Details Pane to the right. Address is your Identity’s physical location. Authentication stores your favorite usernames, passwords, and security questions for creating new accounts. Note: We strongly discourage reusing password for multiple accounts. Fill the Field Name with the question of the field (E.g. Username). Fill the Field Value with your response to the question of the field (E.g. JohnSmith). Other Matching Strings is for an additional Field Name that RoboForm should also detect (E.g. Field Name: Username...Other Matching Strings: User ID). When RoboForm detects an Other Matching String term, it will fill it with the Field Value. Click the Diskette at the top of Editor to Save your Custom Form. RoboForm will remove all punctuation (, . - ! ?) in your custom fields when it fills forms. For a Field Value with a checkmark (E.g. Are you over 18?...✓), fill in the Field Name with the question (Are you over 18? ), and the Field Value with an asterisk, or *. Radio Buttons allow you to only select one option out of a list (E.g. Married, Single, etc.). To create a custom field for radio buttons, simply fill your Field Value with the question (E.g. Marital status) and the field name with your answer (E.g. Single). Note: You don’t have to enter any dashes or spaces for Identity Fields with numbers (E.g. phone numbers, driver license number). On RoboForm Editor, click the “ + ” next to the Identities tab in the Left Panel. The Create New Identity dialog will pop up. Name the Identity, and select their Country. The Create In button allows you to select a Folder for your identity. Note: RoboForm asks for Country in order to localize accordingly. Open your Identity in RoboForm Editor. You can open this in a RoboForm Add-On by selecting Edit for an Identity. You can open this in RoboForm Taskbar Icon by mousing-over Identities and selecting Edit. Go through the Identity Elements (E.g. Person, Business, etc.) and complete or edit the personal details in the Identity Fields (E.g. Date of Birth). Once you are done, click the Diskette (the Save Button). Your information is saved despite the Edit Page still being open. Right click the Element and select New. In the Editor Toolbar, select New [Element] and select New. This will open a dialog to Name your new Element. Afterwards, you can fill the Identity Fields of the new Element in Editor. Your original Element will now be labeled “ [Main] ” in the Navigation. Right click the original Element and select Rename to change its name. Go to the form you would like to fill, an online shopping checkout or an account sign up page for example. In your RoboForm Add-On, select your Identity. Your Forms will be automatically filled. If you have multiple Elements (E.g. Multiple Credit Cards), you can select which one you would like to use. Fill Empty Fields Only makes RoboForm only complete the empty fields. Edit opens the Identity in RoboForm Editor. Sharing opens the RoboForm Sharing window to securely share RoboForm Identities. Sending opens the RoboForm Sending window to securely send RoboForm Identities. See more in Chapter 13: Sharing and Sending. Show opens the details of the Identity in a pop-up window. 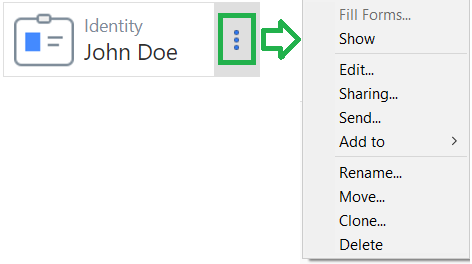 Move allows you to place the Identity into a different Folder. Clone duplicates the Identity in Identities. Fill and Submit automatically fills and submits the form. You can use Selective Form Filling if you would like to fill a select amount of fields on a web page (not all of them). You can do this by selecting (highlight with your mouse) the part of the web page that you want to be filled and click Fill Forms. RoboForm will only fill the fields that you have selected. To learn how to Fill Forms with RoboForm Editor go to Chapter 8: Roboform Editor. The RoboForm Editor is the main tool to organize your RoboForm Data. Editor allows you to view, edit, and create individual RoboForm items and organize them into folders. RoboForm Editor is not available on any Standalone Extensions. Selecting Edit on any item of RoboForm Data. Open RoboForm Taskbar and select Editor. Searching for RoboForm Editor in your Window Files. To have quick access, right click RoboForm Editor and add it to your Desktop, Taskbar, or Windows Start menu. The Left Panel shows the RoboForm Menu button at the top, different tabs of RoboForm Data (E.g. Logins, Bookmarks, etc.) in the middle, and lastly the Security Center. The Navigation Pane has multilevel navigation of the selected tab’s folders and items. The Details Pane on the right shows the contents or the details of the selected item or folder from the Navigation Pane. We’ll go through the details of the RoboForm button and the other tabs in the Left Panel of Editor below. This button is at the top of the Left Panel and is labeled RoboForm. 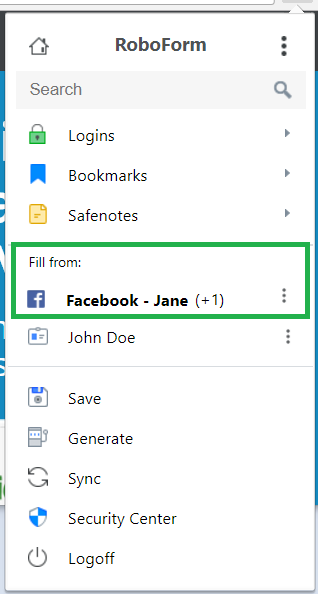 New allows you to create a new Folder, Safenote, Identity, or Login. Note: All of your folders, including empty ones, will appear in all of the menus in Editor for quick access. Status Bar attaches a status bar to the bottom of Editor. This includes a timestamp for when the item or the folder was last edited. Always on Top places the RoboForm Editor on top of all other open windows on your computer. Collapse Left Panel removes the left column from view. Print List creates a printable list of your Logins, Identities, or Safenotes. A dialog appears that previews the printed list you selected. You may click the Print button to print what you see or click Save to save it to an HTML file. New Window opens RoboForm Editor in a new window. Security Center opens the Security Center. Read more in Chapter 15: Security Center. Manual on Editor opens the RoboForm manual for the Editor in a new web page. Save & Close saves any changes to Editor and closes RoboForm Editor. At the top of the Navigation Pane there are three buttons. The Up Arrow Icon opens the parent folder of the folder you are using. The New Folder Icon creates a new folder in the section you are using. Rename changes the name of the item. Move allows you to move the item to another Folder. Cut copies and removes the item from its original location. 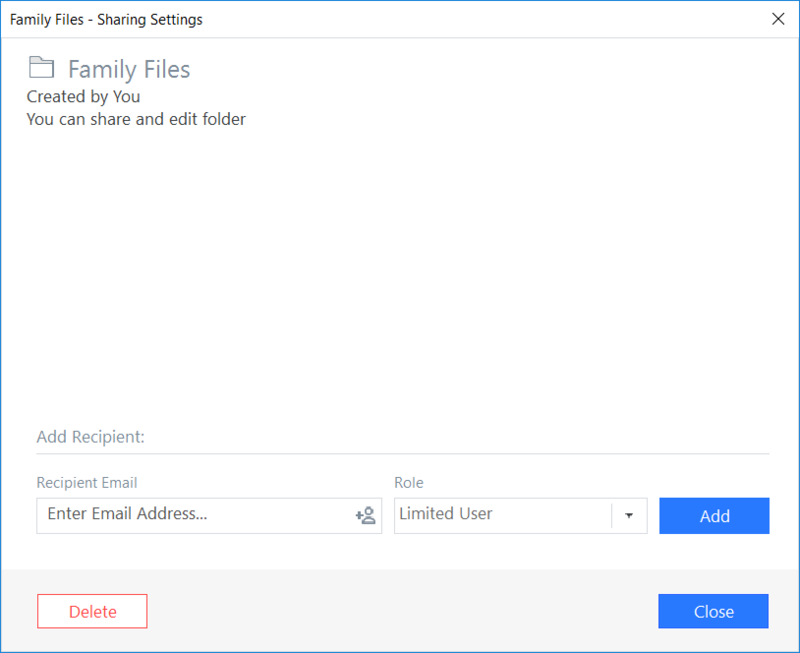 Create Shared Folder creates a folder that can be securely shared between RoboForm users. Read more in Chapter 13: Sharing and Sending. Sharing opens the item in RoboForm sharing. Send opens the item in RoboForm sending. Read more in Chapter 13: Sharing and Sending. New Folder creates a new folder within the folder you selected. Cut copies and removes the folder from its original location. Paste places the copied item or folder into the folder you selected. All of your Logins are organized alphabetically in the Navigation Pane. From this tab, you can go to web pages, fill forms, and edit your Logins. Selecting a Login in the Navigation Pane will open its information in the Details Pane. This includes the Name, Website, User ID, and Password. Clicking the Eye Icon will reveal or hide the password. You can’t create a new Login in Editor. Read more about creating Logins in Chapter 4: Logins. The Pencil Icon allows you to edit the Login. By clicking it, you can edit the URL (for Go To command and Matching Logins) and the user details. The Copy Icon copies the whole text of the Login. You can Drag and Drop the text of a Login into a web page. Simply click and hold the name of an individual field (E.g. Password) and drop it where you like on the page. The Note at the bottom of the page keeps track of password changes and allows you to add any notes to it. Click the Diskette or Save Button to save any changes you made. Login opens the website of the Login and automatically logs you in. Go Fill opens the website of the Login and fills the forms. Go To opens the website of the Login. Diskette (Save Button) saves any changes that you have made to the Login. Send opens the Login in RoboForm sending. Read more in Chapter 13: Sharing and Sending. Print opens the Login in a print preview. Click Print to print what you see or save to save the Login as an HTML File. Undo reverses the previous edit or change in text. Redo reverses the previously “undone” edit or change in text. Drop Changes reverses all edits or changes in text. Convert to Bookmark will change the URL of the Login into a new Bookmark. The other Login information will be deleted. Details shows the details of the Login. Set Reminder creates a timed notification for you to update the password for the selected Login. Add field adds an additional field. A dialog opens asking you to select the Field Type and Field Name. After clicking OK, you can edit that field and save your changes. Rename field allows you to change the Field Name. Delete field removes the field. Ignore field will not fill in the selected field when you visit a page. RoboForm will fill the field with “$AnyValueHere$" into the field, such fields will be ignored by AutoFill, Login and AutoSave. Unignore field reverses the Ignore command and reverses changes. Add Login Tip allows you to add a note to the Login. Note: If you want to remove all changes to your Login, click Drop Changes in the More Menu in the Details Pane. All of your Bookmarks are organized alphabetically in the Navigation Pane. From here you can edit and go to your Bookmarks. Selecting a Bookmark in the Navigation Pane will open its information in the Details Pane. This includes the Website, URL, and any Notes. You can’t create a Bookmark in Editor, read about how to create one in Chapter 5: Bookmarks. The Pencil Icon allows you to edit the Bookmark. By clicking it, you can edit the URL (for Go To command) and the Bookmark Note. The Copy Icon copies the whole text of the Bookmark. You can Drag and Drop the URL of a bookmark into the address bar. While in Edit mode, simply click and hold an individual field - in this case, the URL - and drop it where you like on the page. The Note allows you to add notes. Go To opens the website of the Bookmark. Diskette (Save Button) saves any changes that you have made to the Bookmark. Send opens the Bookmark in RoboForm sending. Read more about sending in Chapter 13: Sharing and Sending. Print opens the Bookmark in a print preview. Click Print to print what you see or save to save the Bookmark as an HTML File. Details shows the details of the item. All of your Application Logins are organized alphabetically in the Navigation Pane. From here you can go to the application, login, and edit your Login. Selecting a Application in the Navigation Pane will open its information in the Details Pane. This includes the Name, Application, User ID, and Password. Clicking the Eye Icon will reveal or hide the password. Application Logins share the same functions in Editor as normal Logins. Please refer to using Logins in Editor in this chapter to learn more about using Applications in Editor. Note: If you want to remove all changes to your Application Login, click Drop Changes. 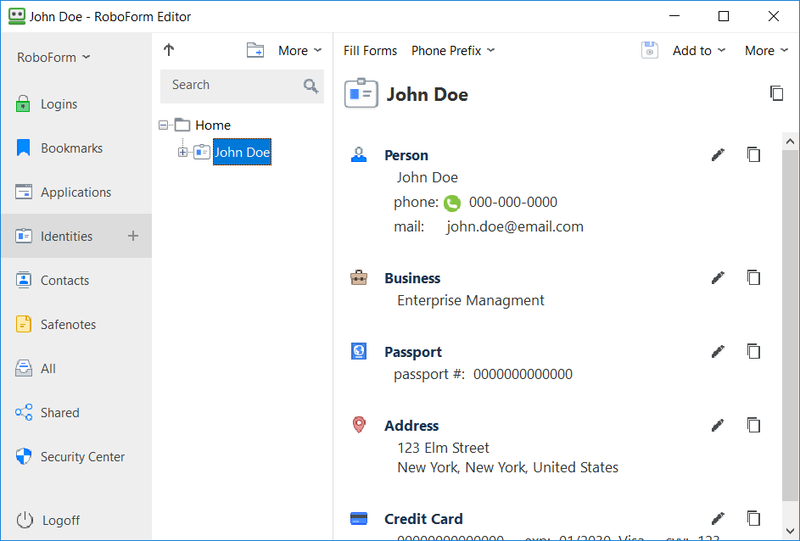 RoboForm Editor is your main tool to create, view, and edit Identities. All of your Identities are ordered alphabetically. Selecting a Login in the Navigation Pane will open an Identity Summary in the Details Pane. 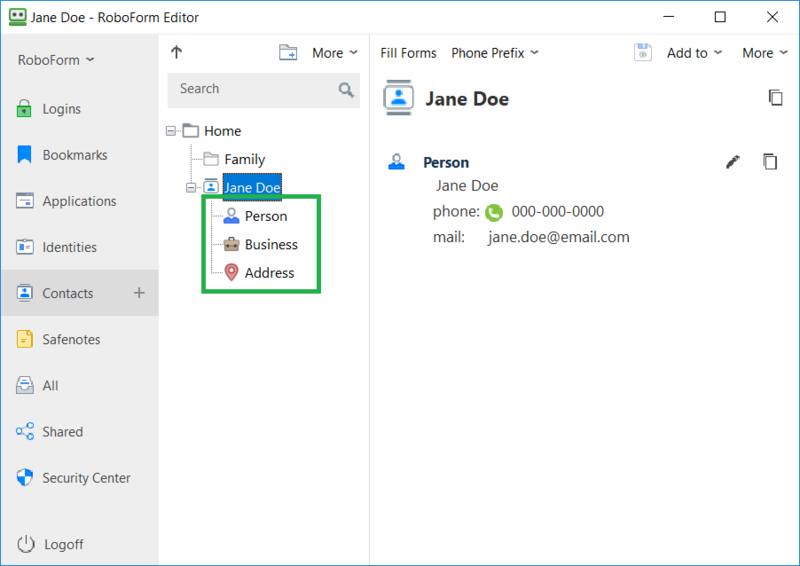 Expanding the Identity folder in the Navigation Pane will show all the Identity Elements. Selecting an Identity Element will open its information in the Details Pane. Each Identity Element is made up of individual Identity Fields (E.g. Date of Birth), or distinct personal details. The Pencil Icon allows you to edit the Identity Element. The Copy Icon copies the whole text of the Identity Summary or an Identity Element. You can Drag and Drop the text of an Identity Element into a web page. Simply click and hold the name of an individual field (E.g. Phone Number) and drop it where you like on the page. Have the browser page open to the form. Click Fill Forms in the RoboForm Toolbar at the top of Editor. Select any form filling options which are detailed in Chapter 7: Identities. Your forms will automatically be filled. 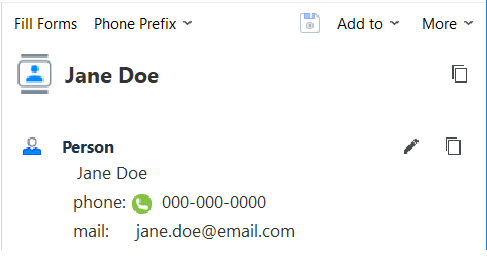 Next to Fill Forms, there is Phone Prefix. This option allows you to format your Identity’s phone number according to the form you are filling. None is the default for calling within the country. National Prefix is the number added to the front of a phone number to call long distance within the country. Country Codes is the number added to the front of a phone number to call internationally. Send opens RoboForm Sending in a new window. Read more in Chapter 13: Sharing and Sending. Print creates a printable version of your Identity. A dialog appears that previews the printed Identity. You may click the Print button to print what you see or click Save to save it to an HTML file. Identity Type can convert your Identity to a Contact. Country is the country of your Identity. Changing the Country might change the country-specific units for your Identity. Advanced allows you to open an App Upload Element in identities. This Application Upload is meant for saving information for licensing software. Contacts are similar to a phone-book. Store individual’s contact information here. 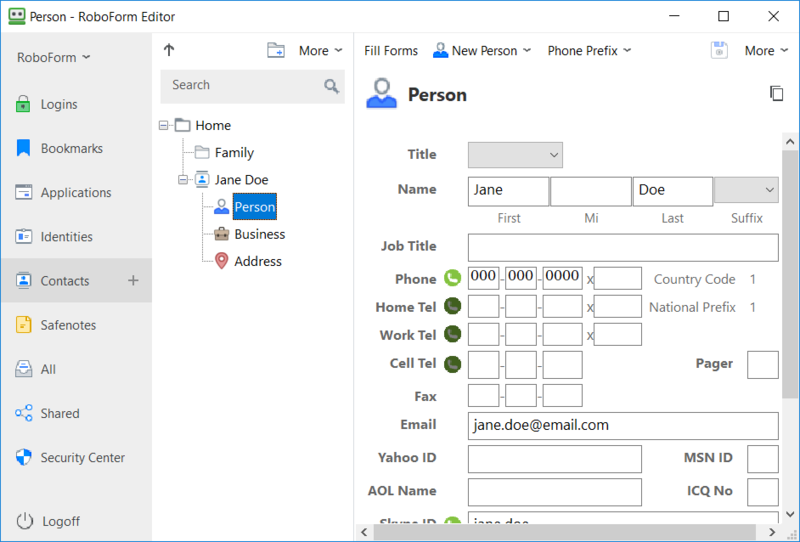 RoboForm Editor is your main tool to create and edit contacts. All of your Contacts are ordered alphabetically. From here you can create contacts, edit them, and fill forms with them. Selecting a Contact in the Navigation Pane will open the Contact Summary in the Details Pane. Expanding the Contact folder in the Navigation Pane will show all the Contact Elements (E.g. Person, Business, Address). Selecting a Contact Element will open its information in the Details Pane. Person has all the fields associated with an individual such as name, phone numbers, etc. Business is the business entity that the Contact is associated with. Address is your Contact’s physical location. In RoboForm Editor, click the “ + ” next to the Contact tab. The New Contact dialog will pop up. Name the Contact, and select their Country. Open your Contact in RoboForm Editor. Select the Pencil Icon near the top right corner. Go through the Contact Elements and edit your personal information in the Contact Fields (E.g. Job Title). Once you are done, click the Diskette, or the Save Button. Your information is saved despite the Edit Page still being open. If you have more than one business or address for a contact, you can create Multiple Contact Elements. Select the Element in the Navigation Pane in RoboForm Editor. This will open a dialog to Name your Element. Your original Element will now be labeled “[Main]” on the left side of editor. Right click the original Element and select Rename to change its name. The Pencil Icon allows you to edit the Contact. The Copy Icon copies the whole text of the Contact. You can Drag and Drop the text of an Contact into a web page. Simply click and hold the name of an individual field (E.g. Phone Number) and drop it where you like on the page. The Phone Prefix, Add to, and More options for Contacts are identical in Identity. Editor is your main tool to create and edit Safenotes. All of your Safenotes are organized alphabetically in the Navigation Pane. From here you can edit and view your Safenotes. Selecting a Safenote in the Navigation Pane will open its information in the Details Pane. Create a Safenote by clicking the “ + ” next to the Safenote tab in the Left Panel. Type it up and save it by clicking the Diskette button. The Pencil Icon allows you to edit the text of the Safenote. The Copy Icon copies the whole text of the Safenote. Click the Diskette or Save Button after you made any changes. You can Drag and Drop the text of the Safenote. Simply click and hold the name of the Safenote and drop it where you like on a web page. Search in text opens a search toolbar near the top of Editor. Your search query will be highlighted within the text of the Safenote. You are able to go between your search results, match the case of the search query, and search for the whole word. Diskette (Save Button) saves any changes that you have made to the Safenote. Print opens the Safenote in a print preview. Click Print to print what you see or save to save the Safenote as an HTML File. Shared shows the RoboForm items that you shared with others or items that are shared with you. Items or Folders with a blue icon are items you shared with others. Items or Folders with a green icon are items that are shared with you. To find out what the different permission levels mean, how to create a Shared Folder, and more Shared Folder information, go to Chapter 13: Sharing and Sending. This shows all of the Logins, Bookmarks, Applications, Identities, Contacts, Safenotes and Folders together. They are organized alphabetically within their sections, e.g. all the Logins are grouped together, all the Safenotes are grouped together. Read more about the Security Center in Chapter 15: Security Center. The RoboForm Taskbar Icon provides quick access to all RoboForm functions and data and makes RoboForm compatible with Win32 applications (E.g. Skype). It opens in a vertical list that includes Logins, Safenotes, and Identities. In Windows, the RoboForm Taskbar Icon appears in System Tray at the bottom right corner where time and date icons are displayed. Make your RoboForm Taskbar Icon visible by opening the arrow- labeled Show Hidden Icons - and dragging and dropping the RoboForm Icon into the Taskbar. 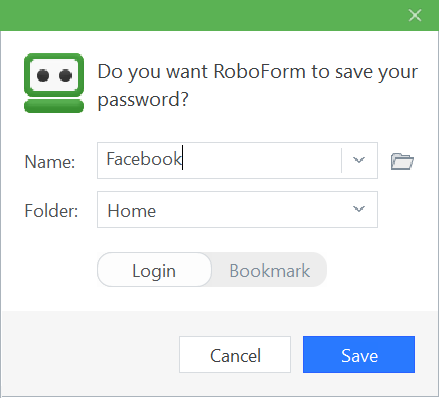 Taskbar data is only accessible when you are logged into RoboForm using your Master Password. It's important to remember and protect this password in order to securely access your encrypted RoboForm Data. You can find Login or Logoff at the top of the taskbar menu. RoboForm automatically logs off after 2 hours of inactivity, which purges the cached Master Password from memory. The RoboForm Taskbar Icon must be present for Auto-Logoff to work. Removing the RoboForm Taskbar Icon will turn off RoboForm. You can do this by clicking Exit at the bottom of Taskbar Icon or turning off RoboForm in your Taskbar Settings. 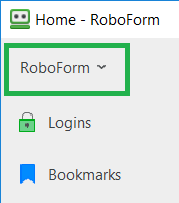 To make the Taskbar Icon appear again, you can login to RoboForm on your RoboForm Add-On or RoboForm Editor. The Help Menu, underneath the Logoff button in the Taskbar Icon, provides many services that will help you understand RoboForm. Manual on Taskbar opens the RoboForm manual for the Taskbar Icon in a new web page. Home Page opens the RoboForm website in a new page. Contact Support To contact support, you must submit a ticket to RoboForm’s support system. After selecting “Contact Support”, RoboForm will prepare a zipped diagnostic file to send to RoboForm’s support system. Select “Yes”. You’ll be directed to RoboForm’s online support system. Enter the email associated with your RoboForm account. You will be redirected to a page with a notice at the top of the page that your log is attached to the support ticket. Scroll to the bottom and type your message and submit your ticket. Click here to directly access the online support system. Problem Steps Recorder: This tool will help explain your problem to support in a step by step video format. Selecting the Problem Steps Recorder, a small pop-up window will open and automatically records your screen. Reenact the steps that trigger the problem. You can Pause Record, Resume Record, Stop Record, Play, and Add Comments. Click Stop Record and Exit once you’ve finished. Problem Steps Recorder prepares a zipped video file and attaches it to your support ticket. RoboForm’s Online Support System will open. Add a message at the bottom of the page to explain your issue and submit the ticket via RoboForm’s online support system. 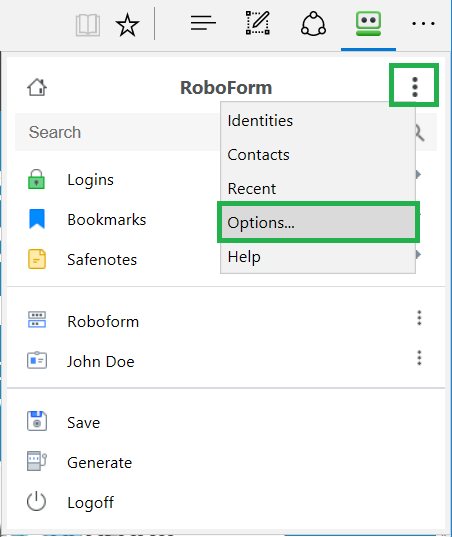 Options opens the settings of RoboForm in a new window. Read more in Chapter 18: Options. Tools has miscellaneous options for RoboForm. Generate Passwords creates a randomly-generated and complex password for you to use] and improve your Login security. Read more in Chapter 12: Password Generator. Import allows you to import passwords from browsers or other password managers into RoboForm. For browsers, click the Import button next to the browser name. For other password managers, click Import from File and follow the directions on the page. Search Box opens in the corner and allows you to search for RoboForm Data or for a query in a search engine. Read more in Chapter 11: Search Box. Sync shows manual synchronization actions for RoboForm Data. Your RoboForm Data already automatically syncs when you are either logged in with your master password or you edit an item. Turn Off Sync stops automatic Syncing for the current device. Browser opens a list of browsers and windows, selecting one will open a Lower RoboForm Toolbar in the window. This is a good way to save Application Logins. Save Forms creates a Login or a Bookmark for the window you are on. 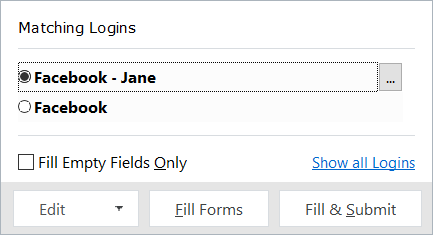 Fill Forms completes the forms on the page with a Matching Login or Identity. Read more in Chapter 4: Logins. Show Toolbar opens a Lower RoboForm Toolbar for the window you are on. AutoFill is an optional function that automatically fills forms (Logins or Identities) when you visit a website. It appears as a dialog in the corner. Note: AutoFill Dialog doesn’t work for browsers using a Standalone Extension. By default, AutoFill dialog is disabled. To enable Autofill, go to RoboForm Options, open the AutoFill tab and check Offer to AutoFill Web (HTML) Forms. Click Save. A login form that matches one of your RoboForm Logins. 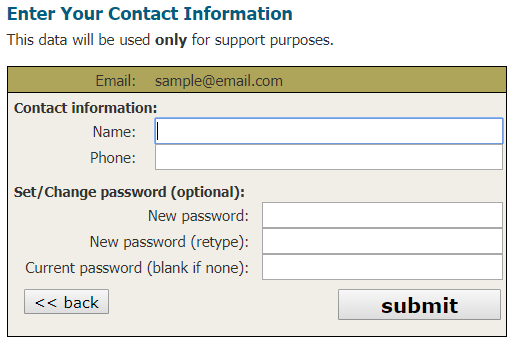 A long non-password form that can be filled by an Identity; by default, 4 fields in a form trigger AutoFill. Select the desired Login or Identity. Fill Forms completes the form with the selected Login or Identity. Fill and Submit completes the form with the selected Login or Identity and submits the form. Do Not AutoFill at … turns off Autofill dialog at that domain. Do Not AutoFill at All sites turns off AutoFill for all Sites. There are more settings for AutoFill actions and appearance within Options > AutoFill. Read more in Chapter 18: RoboForm Options. The Search Box can find a number of queries within RoboForm and around the Web. On Chrome, FF, and Opera, the Search Box is located near the top of the RoboForm Extension. 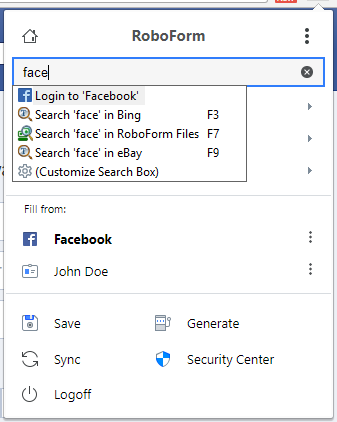 On IE, the Search Box is between the RoboForm button and the Logins button on the RoboForm Toolbar. In Edge, the Search Box is located near the top of the RoboForm Extension. Also just by mousing-over the RoboForm Taskbar, the Search Box will appear. Start typing a word or a phrase. For Logins, it will go to the login page and log you in. For Bookmarks, it will go to the page. For Safenotes and Contacts, it will open the entry in RoboForm Editor. For Identities, it will fill forms. For a Search Engine or Website, it will open that page and search your term. For All RoboForm Items, it will open a window to search your term through all of your RoboForm items. There are also more options by right clicking one of search term options. Logins, Bookmarks, Safenotes, Contacts, and Identities that show up in the search bar maintain the same right click functionality as elsewhere in the software. Right-clicking a Search Engine or Website will show the options to Search in New Window and to Search in This Window. If you press Enter the first search will be selected. Otherwise, select another search with your mouse. Some search terms can also be selected by an F Key (F1-F12 at the top of your keyboard). In Internet Explorer you can do a quick search by highlighting text with your mouse and then selecting the search box. Your highlighted text will appear in the search box. There are more settings for Search Box and appearance within Options > Search. Read more in Chapter 18: RoboForm Options. If you would like to add a website to search in the Search Box, use SearchCards. Go to the website you would like to add, e.g. Wikipedia. Type “rfarg” into their search address. Then click Alt + Shift + Submit/Search. A RoboForm Dialog will pop up, rename it if needed and save it. Type in the name of SearchCard into the RoboForm Search box, e.g. Wikipedia. After selecting it, a RoboForm dialog will pop up. Type the search term that you would like to search in Wikipedia. Click Search and RoboForm will open the page and search it for you. Note: Some websites will require you to click enter the submit or search button again, e.g. Google Maps. The Password Generator generates random unique and complex passwords in order to increase your cyber security. 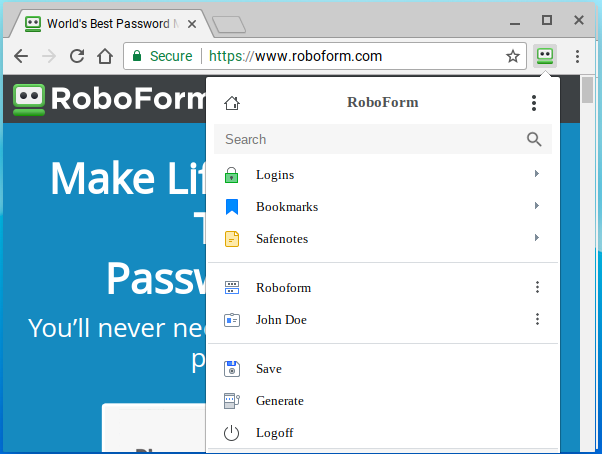 You can find the Password Generator in the RoboForm Add-Ons or under Tools in RoboForm Taskbar Icon. Click Generate in your RoboForm Add-On or in RoboForm Taskbar Icon. Select Copy new generated passwords to clipboard if you would like the password to be automatically copied when you click Generate. If you would like a different password, you can either click Generate New to create a new password or open the Advanced Settings to alter the password. The number of characters in your password. To exclude similar characters which ensures the following characters are not part of the generated password: I, l, 1 and O,0. 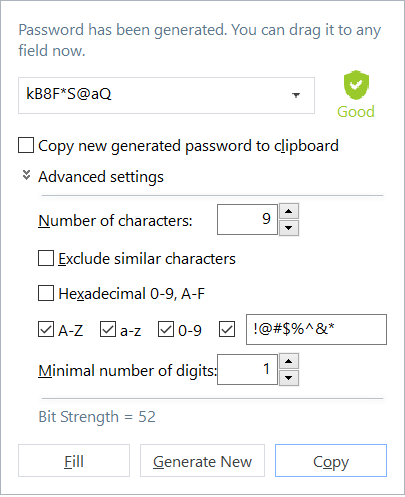 To use only Hexadecimal characters: 0-9, A-F. Unchecking Hexadecimal only characters will allow you to select more characters like capitalized letters, lowercase letters, numbers, and other symbols. The minimal number of digits to be in your password. Remember to click Generate New after you set your Advanced Settings. When you are happy with your new password, either select Fill to fill in the forms on the page, or select Copy to copy the password to your clipboard. The RoboForm Sharing and Sending feature allows you to securely share RoboForm Data (items or folders) with others. Sharing RoboForm Data is like sharing a Google Doc - the shared data is updated to any changes (E.g. changing a password) and access to the shared data can be revoked at any time. The sender may choose multiple recipients. Right-click the item in your RoboForm Add-On, RoboForm Editor, or RoboForm Taskbar. RoboForm Sharing window will open. Enter the recipient's email at the bottom and select Add. The recipient will be shown under Who Has Access with their name and email. If the recipient received and accepted the request their name and email will be listed under Who Has Access (E.g. Jane Doe). If the recipient hasn’t received the request, their status will be Not Recieved Yet. To Revoke Shared Data, click the X on the far right of the recipient. Another dialog will pop up checking whether you are sure to revoke access to this user. A Shared Folder containing multiple RoboForm items is similar to a shared folder in Google Drive. Access to the shared item can be revoked at any time. The sender may choose multiple recipients. 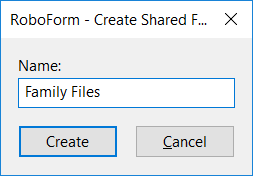 Note: RoboForm Everywhere users can only create one shared folder. 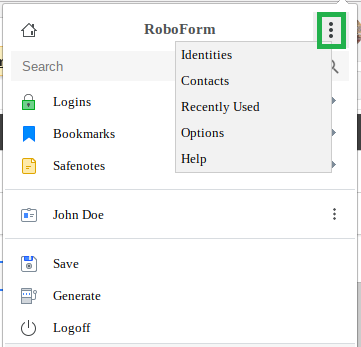 RoboForm for Business Users can create multiple shared folders. Your Shared Folder will now appear in the Navigation Pane. Copy and Paste the item into the Shared Folder. Drag and Drop the item into the Shared Folder. Right-click the item and select Move. A new dialog will open, select your Shared Folder. Find the Shared Folder in the Navigation Pane in RoboForm Editor. Right-click the folder and select Sharing. Enter the recipient's email at the bottom. Select their Role or permission level. The permission levels are explained in detail below. Select Add. If the recipient received and accepted the request their name and email will be listed under Who Has Access. 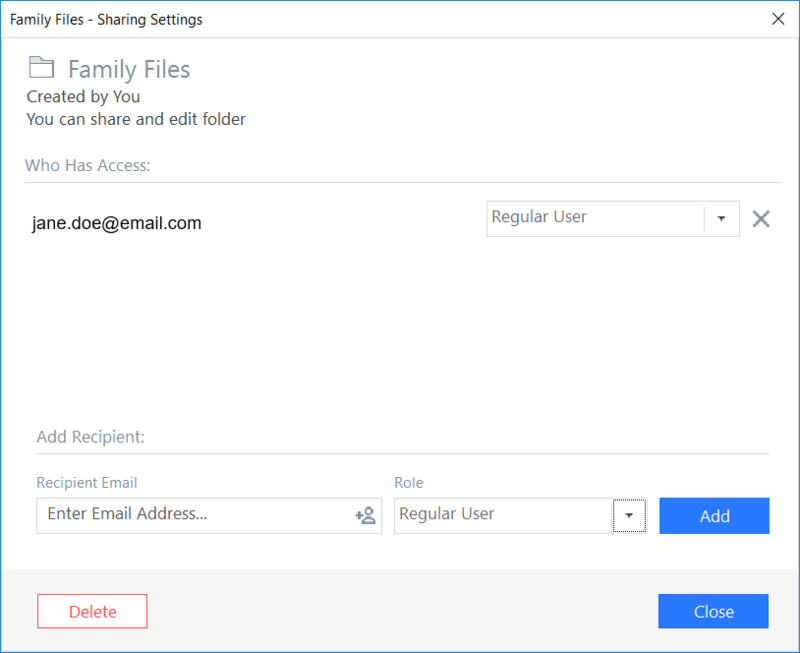 Regular: The recipient can view and edit RoboForm items in the Shared Folder, and the changes they make will be propagated to other recipients and the to sender. Owner: Full access rights. In addition to being able to view and edit all items, the recipient can adjust permission levels, as well as add or remove other recipients (including the original sender). Sending RoboForm Data is similar to sending an email. The RoboForm data is sent once, and any changes won’t be updated (E.g. changing a password) to the recipient and access to the sent data can’t be revoked. You can send an item to multiple recipients. Enter the recipient's email at Send a Login to. A notification will show saying Data was sent to ‘email’. 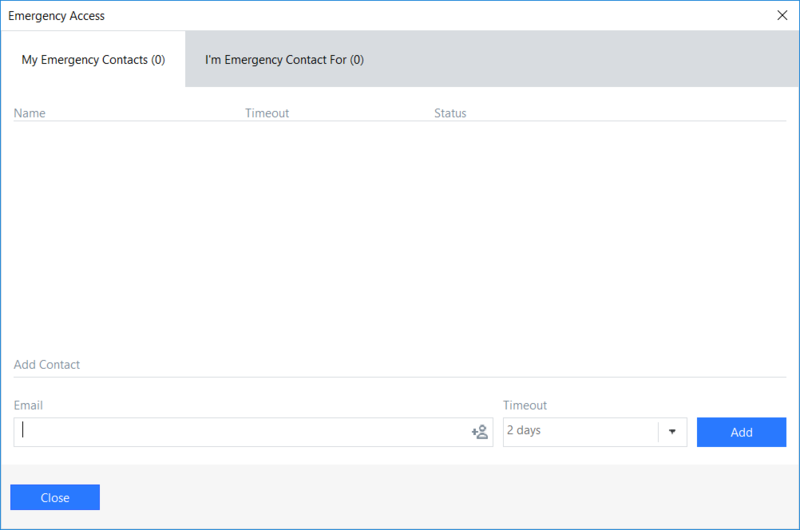 To open Emergency Access and its settings, select it in the RoboForm Taskbar Icon near your computer’s date and time. 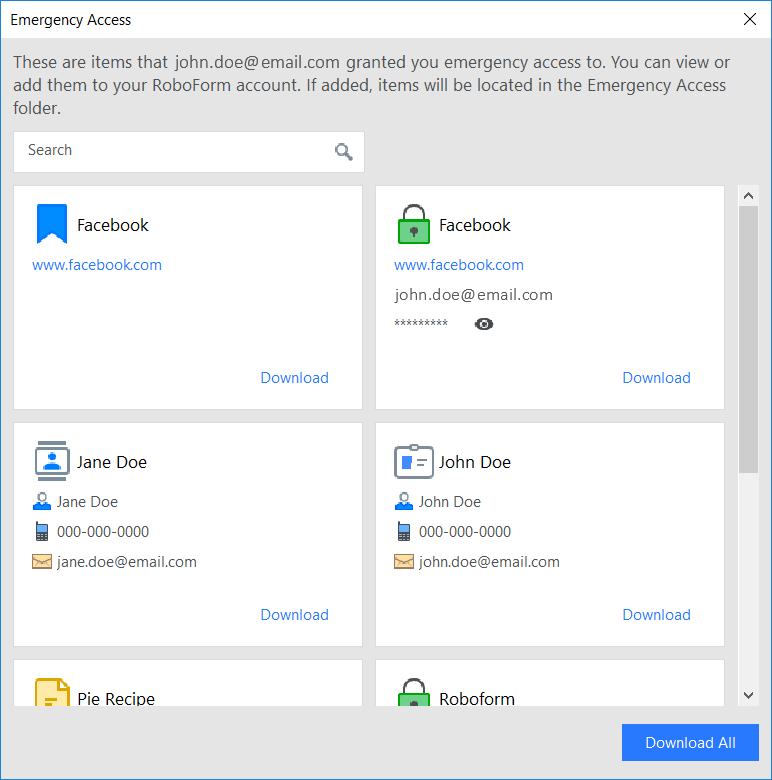 The grantor of the access will open Emergency Access in the RoboForm Taskbar Icon. The recipient can Accept or Decline the Emergency Contact invitation in Emergency Access. Open Emergency Access in the RoboForm Taskbar Icon. After access is granted or the timeout period ends, the Emergency Contact can now go to the tab in Emergency Access for I’m Emergency Contact for. All of the grantor’s RoboForm Data will open in view only mode. The data is available to download to the Emergency Contact’s RoboForm by selecting the individual Download buttons or the Download All button at the bottom. What is Emergency Access and how does it work? Security Center is located in RoboForm Editor as a tab in the Left Panel. Click the tab to open Security Center. Your Security Score is shown at the top of the page. The percentage score, rating (eg: “Good”), and description represent the collective strength of all of your individual passwords. The rating of the Security Score has a range of Low (0-25%), Average (26-50%), Good (51-75%), and Excellent (76-100%). Below the Security Score there are three sections that break down your Individual Logins. The tabs with red shields have items lowering the Security Score, while green shields satisfy the Security Score test. In each of these sections, the Individual Logins can be sorted in an ascending or descending order by Name (alphabetical), Password (alphabetical), Password Strength (Weak to Strong & Vice Versa), and Age (chronological) or how long the password has been stored in RoboForm. Sort them by selecting the category name. The first tab on the left is labeled All. This section lists all the Logins and identifies their Strength Ranking: Weak, Good, or Strong. By default, the Weak Logins are listed first. The levels of Password Strength for individual passwords are determined by the zxcvbn algorithm, which is based on entropy or unpredictability. The strength ratings for individual passwords have a range of Weak (0-25%), Medium (26-50%), Good (51-75%), and Strong (75-100%). In order to achieve a Strong Password Strength rating, create a unique and complex password. The middle tab is labeled Reused and lists multiple Logins with identical passwords. The number in this tab represents the amount of unique passwords that have been reused for multiple websites. Logins are organized under Groups with Reused Passwords; each Group consists of Logins that share the same password. Click the Group to open and close the list of Logins that share the same password. Next, open your RoboForm Add-On in your browser and select Generate. Read more in Chapter 12: Password Generator. RoboForm Online is comprised of web access of your RoboForm Data as well as some user account settings. You are able to view and access Logins, fill forms, and change user and security settings. 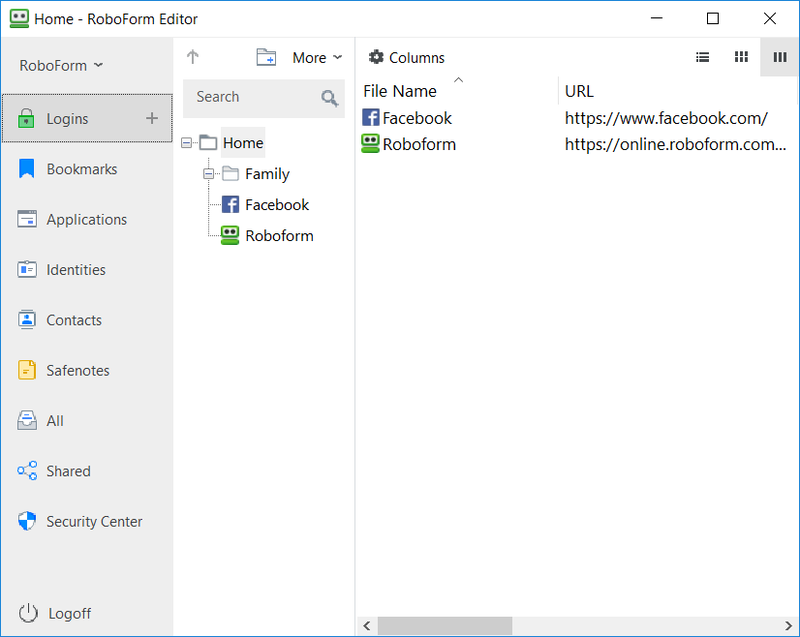 This is a useful tool for people who are using Standalone Extensions such as Microsoft Edge, Linux, or Chrome OS, or for when you want to access to your RoboForm data at a machine where it is not already installed. RoboForm Online can be accessed regardless of whether or not RoboForm has been installed on a particular machine. You can find RoboForm Online here. Simply log in with the email that is associated with RoboForm and your RoboForm Master Password. After logging in, you’ll see a web page of your RoboForm Logins. The RoboForm Button at the top-left will take you to the RoboForm website. Next to the button is the gray Online Toolbar along the top with different tabs such as Files, User Settings, etc. This next section will go through the Web Access of your Files. Your RoboForm items are organized into tabs of your Logins, Identities, Safenotes, and All Files. The tabs are located in a green Toolbar underneath the gray Online Toolbar. 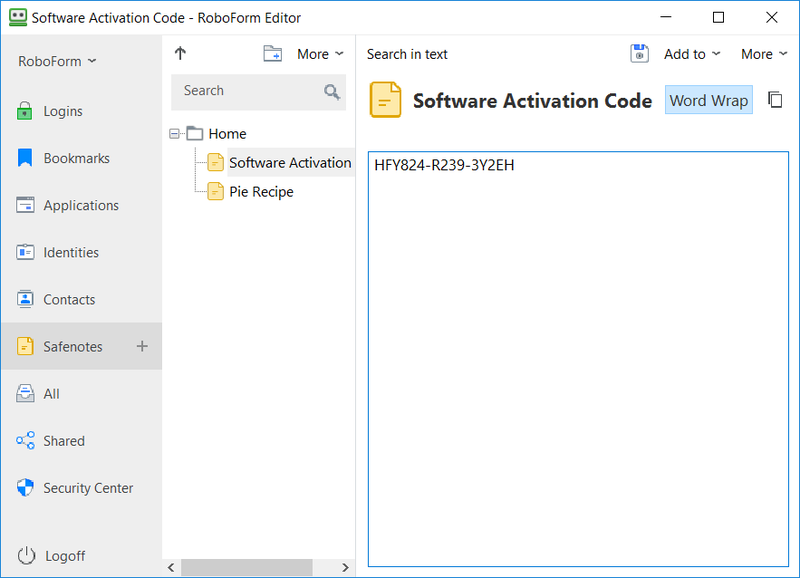 Note: If you are on a Windows or Mac machine where RoboForm is already installed (ie not with the standalone extensions), the list of RoboForm items will reflect what is on the local machine. 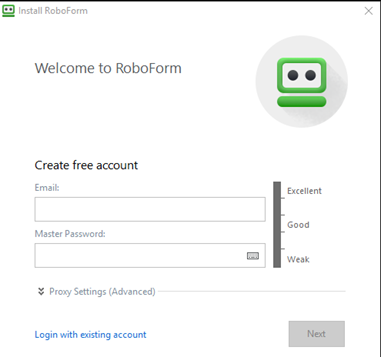 If your are accessing from a Windows or Mac machine where RoboForm is not installed (or with the standalone extensions only), then the list of items will reflect what is on the server. In cases where sync has been turned off, the server list may differ from the local list. Selecting one of the tabs will open a list of RoboForm items in the details pane below the toolbars. If you would like to learn more about any one of File types (E.g. Logins, Identities), consult the Table of Contents and go to the respective chapter. There are some additional functions that are between the toolbars and the details pane. Search Box allows you to search through your RoboForm items. Refresh updates the list of RoboForm items if there are changes. Select All select all of the items within the pane. Select an action on the right to perform an action on all of the items selected. Make Smaller or Bigger minimizes and maximizes the icon and text size of the items. Rename/Move opens a dialog that allows you to rename your Folder or move your Folder to another Folder. Copy to Folder opens a dialog that allows you to add a copy of a Folder to another Folder. 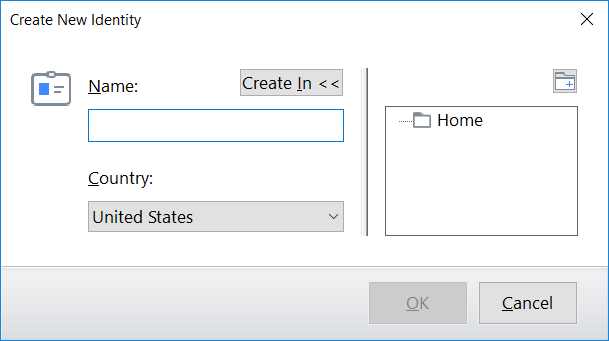 Create Folder opens a dialog that allows you to name and create a folder within the Folder you have selected. Login opens the Login or Bookmark URL in a new window and logs you in. Go To only opens the selected Login or Bookmark website. View opens the Login or Bookmark information in a new window. Rename/Move opens a dialog that allows you to rename your item or move your item to another folder. Copy to Folder opens a dialog that allows you to add a copy of an item to a selected folder. Create Folder opens a dialog that allows you to name and create a folder. View opens the information of an Identity or Contact in a new window. View opens the text of your Safenote in a new window. All Files shows all of your items and folders in one list. The commands in the Action Menu will correspond to what type of item it is; read more above about the commands available for each type of item. 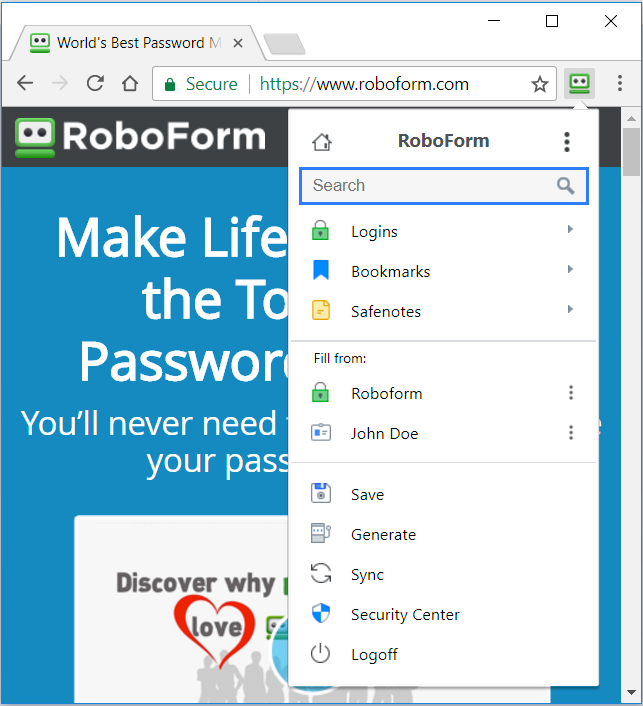 The gray Online Toolbar along the top of the page has many tabs for RoboForm Online Settings, such as User Settings, Security, etc. This next section will go over those settings. Here you will be able to view and edit some of your User Settings. Email asks you to verify your Email with RoboForm. This will be used for One Time Passwords and other important security information. After you add your email, you will be prompted to submit the verification code that you will receive in a verification email. Phone asks you to add a phone number for RoboForm. This will be used to receive One Time Passwords. After you add your phone number, you will be prompted to submit the verification code that you will receive in a verification text. RoboForm Files shows how many files you have, what type of files they are and how much space they are using. There is also a button to Delete all Files. 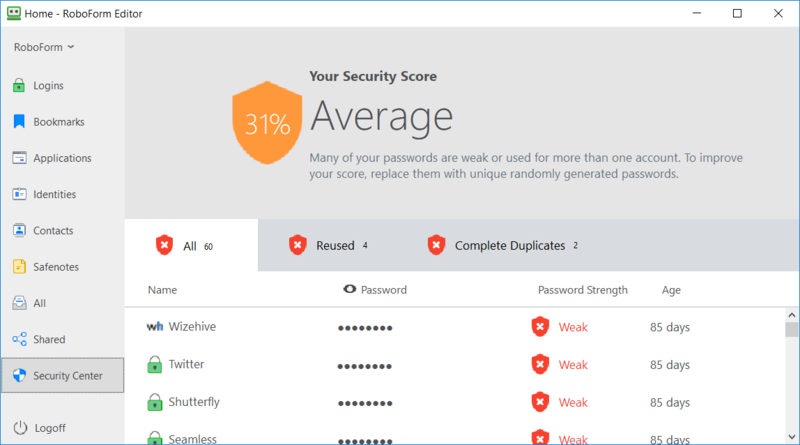 Security Score shows the collective strength of your passwords in RoboForm. To learn more about your Security Score, go to Chapter 15: Security Center. Previous Versions shows how much storage your previous versions of RoboForm take up in the server. Auxiliary Files shows the space your Auxiliary Files are taking up in the server. Available shows the amount of space available on your RoboForm. Remove Sync Lock unlocks any files that were locked during a previous sync. Any file that is locked will not be able to sync until the lock is removed. These files were locked because they were in use or open during a previous sync. Total is the total amount of space you can use on the RoboForm Server. There is also a Delete Account button to delete your RoboForm account. This tab shows Security Options for your RoboForm account and data. One Time Password adds a layer of security to your RoboForm Everywhere account. After turning on One Time Passwords, you will enroll all of your computers and devices that RoboForm is connected to (you can see these devices in the Sessions tab in the Online Toolbar). Only enrolled devices can access your account with One Time Password on. When attempting to access your account from a new computer or device, a One Time Password will be sent to you via email or text. Using that One Time Password will allow you to use your RoboForm account on the new computer or device. Select how you would like to receive your One Time Password: Email or Text. Select Add Email or Add Phone if you haven’t added one yet. Move to step 3 if you have. Enter your Email or Phone Number and click Submit. A Verification Email or Verification Text will be sent to the email or the phone number you entered. 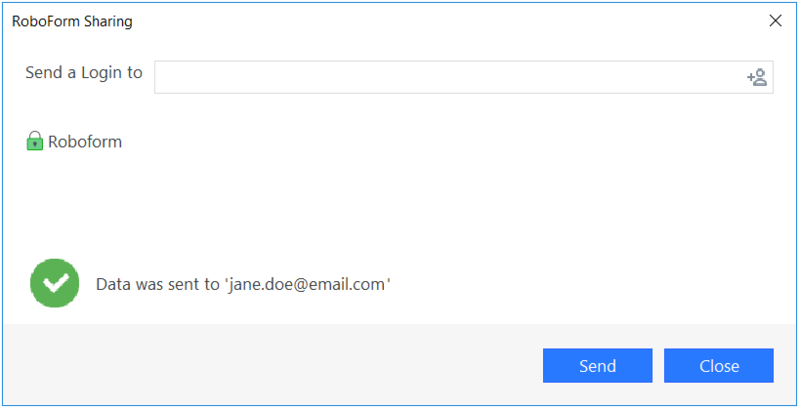 A prompt will appear asking for the Verification Code that is in the email or text you received. A prompt will tell you that your email or phone number has been verified. 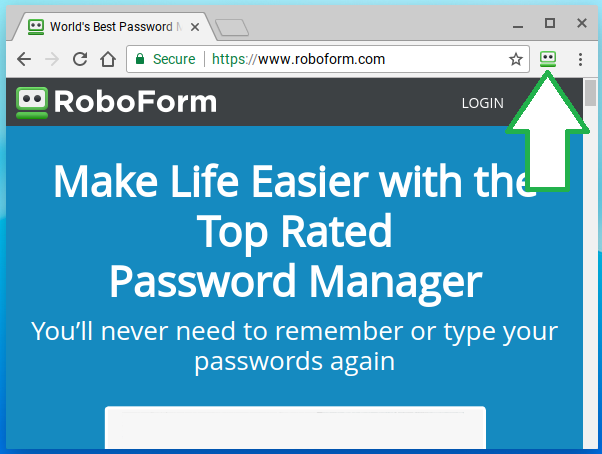 Go to the Security Tab on RoboForm Online, select which verified method (Email or Phone SMS) you would like to receive your One Time Password. A prompt will appear saying that the One Time Password has been turned on. To stop using One Time Password, simple click the Turn Off button on the Security page. Access RoboForm on your new device. A Verification page will appear asking to submit the Verification Code that you will be sent either over email or text. Submit the code, and you will be able to access RoboForm on the new device. Change Account Password allows you to change your RoboForm Account Password. Simply type in your current password and your new password, and click submit. For creating a new password, follow the suggestions listed by RoboForm, or create a new password with the Password Generator which you can read about in Chapter 12: Password Generator. Session Timeout sets the time period before RoboForm Online logs out. Simply type in the amount of minutes before timeout and click submit. Enrollment Period is the time period that your One Time Password devices will be logged into your RoboForm account. After this time period, the devices will log out of RoboForm for your security. To change the time period, simply type in the amount of days and click submit. If you are using One Time Password, the first pane shows Authorized Devices under the One Time Password. The other pane shows Devices with Recent RoboForm Activity. The panes list the date and time when the device was authorized, the browser, the device, and the IP address. You can delete devices that have been authorized under the One Time Password by selecting it and clicking Delete Selected. You can download a Summary Log or a Detailed Log of the device sessions at the bottom of the page. This page shows your Licenses, which is your paid permit for RoboForm Everywhere. If you do not have a RoboForm License and are using RoboForm Free, there’ll be a link to purchase RoboForm Everywhere. The page will show you information about each of your licenses, the Start Date of the License when it was activated (Year-Month-Date), the Expiration Date of the License when it will expire (Year-Month-Date), and what account email the License is assigned to. If your License is expired or is getting close to expiration, click Renew to open your RoboForm Shopping Cart and to select your License Period for purchase. Upgrade to Family Plan will open the RoboForm Shopping Cart with an upgrade for the Family Plan. The Family Plan will get you 5 RoboForm Everywhere accounts under one subscription. Read more about the Family Plan here. This is where you can see the status of your Emergency Access online. Read more in Chapter 14: Emergency Access. The page shows two tabs. My Emergency Contacts shows who your emergency contacts are; these are the recipients of your emergency access. The other tab is I am Emergency Contact For and shows people who are sending you their emergency access. On this page, you can request access to their RoboForm Data and begin the timeout period. The tabs are structured similarly. 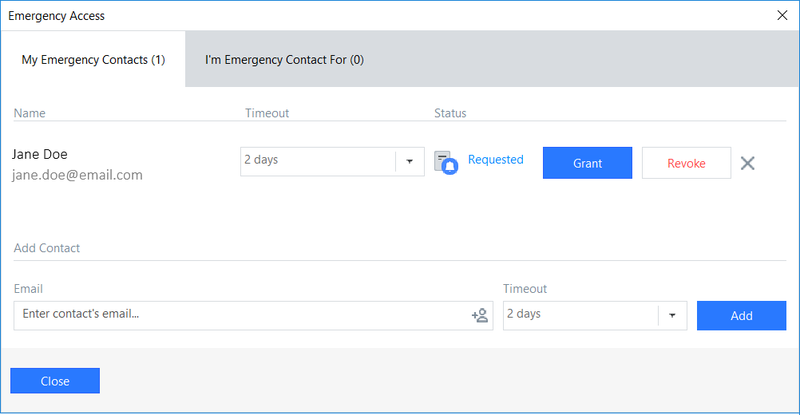 They show the User Name and the Email of the contact, the Creation Date of the emergency access request, the Timeout before RoboForm data can be available, and the Status of the contact - not received, rejected, no access. “No access” means that no request has been made. This opens the RoboForm Support Page in a new window. Support has many useful resources that will help you understand RoboForm, including the Help Center, the Manual, and the Online or Phone Support System. 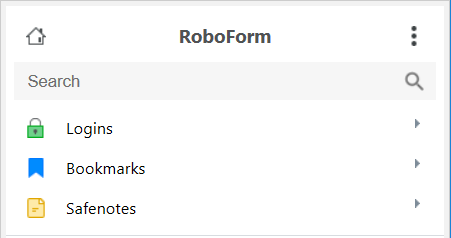 The RoboForm Start Page is on your browser at https://start.roboform.com and allows quick access to all of your Logins, Bookmarks, and Safenotes on Windows and Mac. The Start Page cannot be accessed without RoboForm being installed. 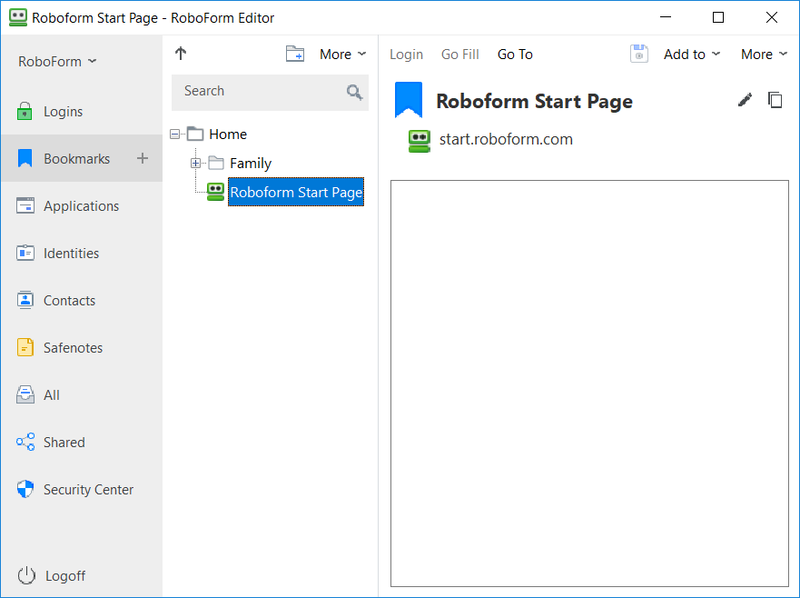 Note: RoboForm Start Page is not available with Standalone Extensions such as Microsoft Edge and Chrome Standalone. Once you are on the Start Page, you will see the Start Page Toolbar at the top of the web page with a Search Bar and different tabs: Pinned, Popular, Logins, etc. Below that is the Navigation Pane which shows the items and folders of the selected tab. The RoboForm Button in the top-left corner of the Start Page Toolbar opens the RoboForm website in a new tab. The Search Bar in the middle helps you find RoboForm items instantly and also search for queries in Search Engines. Clicking the Identity shown in the top-right corner of the Start Page Toolbar will open the Identity in RoboForm Editor. Clicking the arrow will show other Identities to open in Editor. Read in Chapter 8: Roboform Editor. Selecting the Three Dots or Right Clicking an Identity opens more options. Show opens the Identity Summary in a new window. Edit opens the Identity in Editor. Sharing opens the RoboForm Sharing window to securely share Identities. Sending opens the RoboForm Sending window to securely send Identities. See more about Sharing and Sending in Chapter 13: Sharing and Sending. RoboForm Items are shown as shown as Icons in the Navigation Pane of RoboForm Start Page. Folders are shown on the left side of the Navigation Pane. Selecting one of them will open the folder and files will be shown as File Icons in the Navigation Pane. Click Home in the upper-left corner to go back to all of the Logins. When you hover above the icon, a Pin Icon and Three Dots appear. Edit opens the item in RoboForm Editor. Sharing opens the RoboForm Sharing window to securely share RoboForm items. Sending opens the RoboForm Sending window to securely send RoboForm items. See more about Sharing and Sending in Chapter 13: Sharing and Sending. Rename changes the name of the File. Move allows you to place the File into a different Folder. 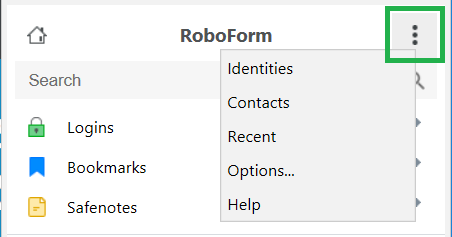 You can Pin your RoboForm Data to the Pinned Page for quick access to your favorite Logins and Bookmarks. You can do this by selecting the Push Pin Icon in the top-right corner of an item. This adds it to the Most Popular list in your RoboForm Add-Ons. This tab is labeled Popular by default, but you can change it to Recent and All by clicking the arrow next to the name of the tab. Popular shows the most often used items of RoboForm Data. Recent shows the most recently used items of RoboForm Data. All shows all of your items of RoboForm Data. Options hosts all the settings and preferences for RoboForm. For RoboForm Extensions, select the Three Dots and click Options. For Internet Explorer Toolbar, Select the RoboForm Button and click Options. In RoboForm Editor, select the RoboForm Button and click Options. In the RoboForm Taskbar Icon, select Options. The Options window is split into two sections. The Left Panel shows navigation tabs such as Language, Browsers & Apps, etc. The Details Pane shows the options available of the selected navigation tab. Reset to Defaults will change all of your options to their original default settings. Save will save any changes you made in settings. Clicking save will close the Options window. Cancel closes the Options window without saving any of your changes. The next section will go through each tab in the Left Panel and explain the options in each tab. Language’s main function is to change the language for your RoboForm interface. Simply select the language in the drop-down menu. Edit Language File is the language editor. Note: This is for development purposes. At the top of the Edit Language File window, you are able to select whether to show untranslated, modified and translated strings. Load opens a language file into the Language Editor. Apply implements the translated text into RoboForm. Save saves your changes or edits as an rfs file. Send forwards your Language File to RoboForm Support System. Edit directly in the table by typing in your updated String into String. Double click the row or String you would like to edit. A pop up window will appear. New Language File creates a new language file. Note: This is for development purposes. This tab shows which Browsers and Applications can connect to RoboForm. Your installed Browsers will be shown at the top of the page. Click the checkbox next to the browser name if you would like to enable RoboForm on that Browser. For Chromium and Chromium-based browsers and Firefox-based browsers, simply open one of these browsers and drag the respective Icon onto the page. RoboForm will attach to the browser. Below the browsers, there is a checkbox for RoboForm to attach to Windows Applications (E.g. Skype, Itunes). Below Windows Applications, there is an Application Black List. Add applications that you would not like RoboForm to attach to. These are options for the Toolbar which are now only available for Internet Explorer. Checking the box for Show Bookmarks and Logins together will combine Bookmarks and Logins in the Logins menu. You can select that a Login from Toolbar opens web site either in the Same Browser Window or in a New Browser Window. 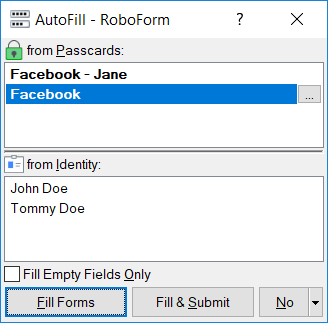 Form filling options has an option for Fill & Submit, which is a RoboForm feature that automatically fills and submits the forms. If you would like Fill & Submit to be your default action for Matching Logins or Identities, select the respective check box. The next box shows the Maximum number of items in the Most Recently Used List. This list shows your most recently used RoboForm items. Simply type or click the up and down arrows to change the number. The next box shows the Maximum number of items in the Most Popular List. This list shows your most often used RoboForm items. Simply type or click the up and down arrows to change the number. Maximum Matching Login button width in pixels changes the size of the Matching Logins Button. 200 pixels is the default size. Simply type the amount of desired pixels to change the size. Number of My Identity Buttons changes how many Identities you want to be visible in your toolbar. Simply type the number to change the amount. Maximum Matching My Identity button width in pixels changes the size of the Identity Button. 100 pixels is the default size. Simply type the amount of desired pixels to change the size. Search Box Width in pixels changes the size of the Search Box. 150 pixels is the default size. Simply type the amount of desired pixels to change the size. Mini Dialog appearance delay time in milliseconds changes the time in milliseconds it takes for the mini-dialog for Matching Logins and Identities to pop up. 100 milliseconds is the default time. Simply type the amount of desired milliseconds to change the time. This page provides options for Data and Syncing Data. Account shows the Email associated with your RoboForm Account. Clicking the email will open RoboForm Online. Read more in Chapter 16: RoboForm Online. Checking the box for Automatic Sync will automatically sync your device and your RoboForm account whenever you log in with your master password or you edit an item. Uncheck this if you want to do manual sync. One way you can do a manual sync is by clicking Sync RoboForm on this options page. Another way is by clicking the three dots in your RoboForm Add-On, going to the Sync menu and clicking Sync RoboForm there. Settings opens the account sync settings in a new window, click the arrows next to Proxy Setting to open the advanced settings. Show Changed Files without Syncing (Analyze only) analyzes the RoboForm data without syncing. Change Account opens a dialog to login into a different RoboForm Account. Import allows you to import any data from browsers or other password managers to RoboForm. For browsers, click the Import button next to the browser name. For other password managers, click Import from File and follow the directions on the page. Import into folder: allows you to select a folder to import your data into. Export to allows you to export your RoboForm Data to a location on your computer. Go to RoboForm Options > Data & Sync and click Export To. Select the Folder you would like to export under Data to Export. Then select a Location for your exported data in Browse. Select the format you would like your files to be exported in. The options are Internet Explorer Favorites, HTML file or CSV file. The Export will show its status bar and say when the Export is complete. You can click the Open containing folder to see where the exported data is now. 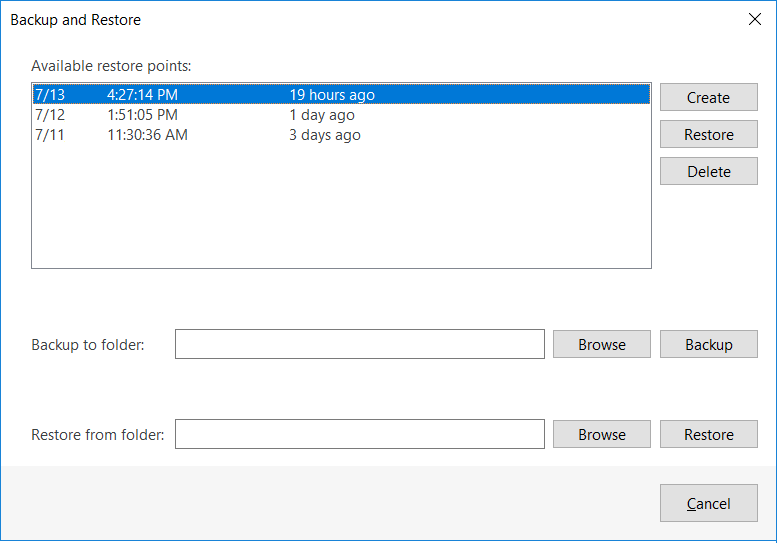 Backup and Restore opens a window showing options to backup or restore your RoboForm Data. The first pane shows Available Restore Points. These are points in time that RoboForm Data can be restored back to - your restored data would match your data at that time point. To restore data to a time point, simply select the desired restore point and click Restore. To create a new restore point click Create; it’ll appear at the top of the list. To remove a restore point, select it and click Delete. Below, Backup to folder allows you to find a backup location for your RoboForm Data. Simply find the location in Browse and click Backup. Lastly, Restore to folder allows you to find a restore location for your RoboForm Data. Simply find the location in Browse and click Restore. Re-convert RoboForm ver. 7 User Data converts your version 7 data into version 8 format of data. Select Data Folder allows you to select a custom directory location for RoboForm data. This page provides Security options. Read more in Chapter 19: Security. Change Master Password allows you to change you master password. Go to RoboForm Options > Security and select Change Master Password. 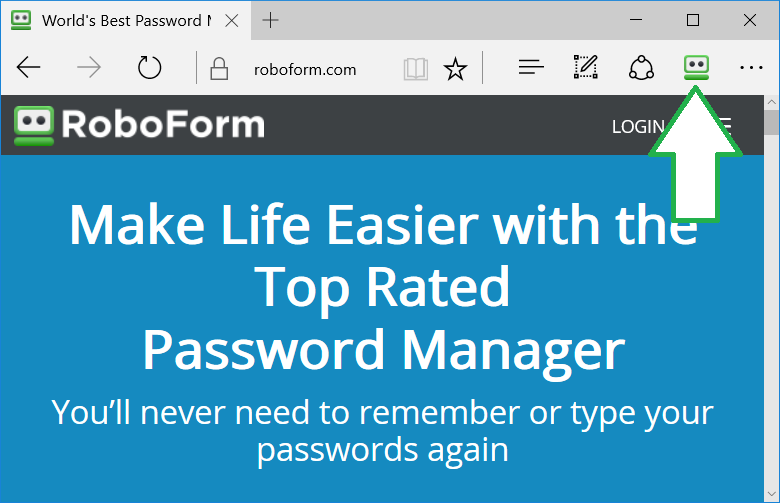 If you have forgotten your master password, RoboForm cannot restore your master password. RoboForm will prompt you to setup a new account. Read more in Chapter 19: Security. A dialog will open asking for your current Master Password. On the next page, enter and retype your new Master Password. Please memorize your Master Password. It cannot be recovered if forgotten. The dialog will say the RoboForm Setup is Completed. Your Master Password has been changed. Checking the box for Don’t ask for Master Password will turn off the prompt requesting the Master Password. For security reasons, we recommend against this. If you have a Windows Biometric Framework (WBF) attached to your computer, you can Enable fingerprint authentication on the WBF reader. Automatic Logoff is the time period before RoboForm automatically logs you off. You can turn off Auto-Logoff by checking the box. The number at the bottom shows the amount of minutes before Automatic Logoff. To change the time period, simply type in a number or click the up and down arrows to select a number of minutes. This page provides AutoFill options. Read more in Chapter 10: AutoFill Dialog. Warn about filling from Passcard (Login) into Domain not in Passcard (Login) is a pop up warning for using a Login that doesn’t match the website. For example, a warning will pop up if you try to login to Facebook’s website with your Google Login. The checkbox for Offer to AutoFill Windows dialog in Browsers (Basic Authentication). When RoboForm encounters a Windows Dialog, also known as a Basic Authentication, AutoFill will offer to fill the Matching Login. Read more about Basic Authentication in Chapter 4: Logins. The checkbox for AutoFill Without Asking will automatically fill all forms when you visit a web page with the Matching Login or Identity. If there are multiple matching Logins, the AutoFill dialog will pop up. Read more about AutoFill in Chapter 10: AutoFill Dialog. Only from Passcards (Logins) will only AutoFill when there are Matching Logins. Only from Identities will only AutoFill when there are long non-login forms that could be filled by an Identity. From Passcards (Logins) & Identities will AutoFill for both Matching Logins and Identities. AutoFill from Passcards (Logins) only on pages with Passwords will only AutoFill Logins for pages that only ask for your password. If there is no password field, AutoFill not pop up. Number of fields that Triggers AutoFill from Identity is the amount of fields in a non-password form (E.g. Shopping check-out) that triggers AutoFill from Identity. Simply type or click the up and down arrows to change this number. This page provides AutoSave options. Read more about AutoSave in Chapter 4: Logins. The option for Offer to Save Logins from web (HTML) forms will open the AutoSave dialog when you are saving a Login web form, also known as HTML form. The checkbox for Offer to Save Logins from Windows dialogs in browsers (Basic Auth) will open the AutoSave dialog when you submit (login to) a Windows Dialog or Basic Authentication form. Read more about Basic Authentication in Chapter 4: Logins. Check the option for ALT + click of Login button forces AutoSave for a simple alternative to AutoSave. Type in your login details and select ALT + click the login button for the AutoSave Dialog to appear. Note: Alt + Clicking a link in Google Chrome will download the link of the button. For SHIFT + ENTER in text field forces AutoSave, clicking Shift and then Enter will open AutoSave for any text field. This page provides Context Menu options for Internet Explorer. The context menu opens when you right click in IE. This page consists of a checkbox list of items that can appear in your Context Menu and in your RoboForm Toolbar. Simply check what you would like to see and uncheck what you would like to be removed in the Context Menu. There's a Select All and a Remove All button below both the Toolbar and the Web Context Menu. Show RoboForm Toolbar changes the visibility of the RoboForm Toolbar. Fill Forms completes the form on the page with the Matching Login or Identity. RoboForm Editor opens the RoboForm Editor in a new window. RoboForm Options opens the RoboForm Options in a new window. Sync RoboForm Data does a manual synchronization of your RoboForm Data. Customize Menu gives you options of how to organize your IE toolbar. Password Generator opens the RoboForm password generator. RoboForm Taskbar Icon opens the RoboForm Taskbar Icon. Set Fields completes any check box fields. Reset Fields puts the original values into the fields. Clear Fields removes any text from the fields. Logoff signs you out of RoboForm. 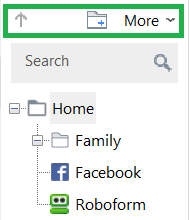 This page provides Search options for the Search Box in the RoboForm Add-Ons and RoboForm Taskbar Icon. Search List Actions shows which websites you can use for the RoboForm Search Box. Check the ones you want and Uncheck the ones you want to hide. Move Up will move up the item in the list, placing it higher in the Search Box. Move Down will move down the item in the list, placing it lower in the Search Box. Remove will delete the item from the Seach List Action and Search Box. Edit edits the Search List Action. Hot Key allows you to select which hotkey (E.g. F1, F2) will be connected to the action. After typing your search query, pressing the hotkey will submit the search. Save Search History will save your most recent search terms. Clear will delete your search history. Max number of Items in Search History can change the maximum amount of search terms you have in your Search History. Simply type an amount or click the up and down arrows to change the amount. Internet Explorer has RoboForm Shortcuts that you can use to get quick access to RoboForm commands. The check box at the top will Enable RoboForm Shortcuts in Browser. Unchecking it will disable shortcuts. To do a shortcut, all you do is hold Alt and the Key command to trigger the shortcut. Alt + - Resets Fields to their original values. Alt + = Set Fields with check marks. Alt + 0 Clears the Fields that are filled. Alt + 1-9 Fills in your Identity according to the order, 1 being the first identity. Some websites are under the same organizations and utilize the same Logins or Accounts, but have different URLs. These are called Mirrors; E.g. Bank of America uses mbna.com, bankofamerica.com, bofa.com, and usecfo.com. Domain Equivalencies simplifies this problem by creating a single Login for multiple sites. For this list, add Domains that share the same Login. Use " = " to mark the domains equal each other, e.g. “mbna.com = bankofamerica.com”. These settings will then apply in Matching Logins. The security of our users’ data is of the utmost importance to us. The next few sections outline the different layers of protection that RoboForm employs. All RoboForm data is packed into a single file encrypted using AES encryption with 256-bit keys. To protect against dictionary, brute force, or other attacks, we generate encryption keys using the PBKDF2 password hashing algorithm with a random salt and SHA-256 as a hash function. All decryption of your RoboForm data happens on your device and not on our servers. The encryption key is derived from the Master Password and never leaves the client device. This applies for both installed versions of RoboForm as well as web access. No RoboForm data can be accessed without the Master Password. We have no way of knowing what your Master Password is because RoboForm does not transmit it to our servers. This is why it is very important to memorize your Master Password. Should you no longer have access to it, we have no way of assisting in regaining access to your data without the Master Password. As part of RoboForm Everywhere, we offer secure sync and backup of encrypted RoboForm data (sync can be turned off on Windows and Mac). All RoboForm data that leaves your device is encrypted both in transit and when stored on our servers. To enable the sync process, our server has to authenticate your RoboForm account credentials. To do this, we use an authentication hash. The authentication hash is generated from your Master Password. However, we use a different algorithm than that for deriving the local encryption key. This is how we securely sync without being able to decrypt your underlying data, nor know what your Master Password is. We use public-private key encryption for our Secure Sharing feature as well as for individual item Sending. This allows you to provide access to your RoboForm data to trusted recipients with different permission levels without sharing your Master Password.